HERE IT IS. The vegan blue cheese recipe is finally here guys! I’m really, really excited about this recipe. First, because I’m working on it since several months and secondly because it tastes exactly like blue cheese. The texture is just perfect, it’s creamy so you can spread it easily on a slice of bread, but firm enough to cut it into slices. It has that rich and strong aroma. This cheese is actually even stronger in taste than my vegan aged camembert! Non-vegans could not believe it was not “real” blue cheese! Just like the vegan aged camembert, this blue cheese is made with one 4 ingredients: cashews, probiotics, mold cultures and salt. The recipe is actually pretty easy to make, the hardest part is to be patient since the whole process will take over a month. You start by soaking the cashews in water for at least 5 hours. Then you blend them with the coconut oil, water, probiotics and penicillium roqueforti until you get a thick and creamy mixture. The probiotics will trigger the fermentation process and the mold will give the cheese it’s rich flavor and blue color. The coconut oil is here to add creaminess, it also helps the mold grow since it requires a lot of fat. I recommend refined coconut oil, that has been deodorized. Please do not omit any ingredient. You can get the penicillium roqueforti mold here. It might seems a little bit expensive for a small bottle but a little goes a long way. For 4 cheeses you will only need 1/8 tsp, which means you will be able to make about 100 batches of 4 cheeses with one bottle. The bottle can be stored in the freezer for a long time. If you are located in Europe, you can find vegan cultures, supplies and everything you need to make vegan cheeses on Cashewbert. The exterior of this blue cheese is dark blue because I didn’t scrape the sides. The rind is edible, but if you prefer the exterior to be white, you can gently scrap the mold using a clean knife every two weeks. I prefer to leave the rind because…well it looks cooler and after about a month it will become a little bit firmer. Creamy inside + firm rind = perfect cheese to me. The mixture needs to ferment at room temperature for one day before you place it in springform pans. After 2 days you need to salt the exterior of the cheeses, salt will help the mold grow and make the cheese tastier. The dark blueish mold is what gives the cheese its characteristic flavor. The problem is the mold needs to be in contact with the air to grow, so you need to have many small openings inside the cheese for better mold growth. Regular blue cheeses are often pierced several times with a skewer to make holes, I tried this way but without success. After severals tries, I thought of scrambling the cheese into little pieces and then forming it again without pressing to much to leave large holes inside it. It changed everything. This step must be done when the cheese is a little bit firmer, at about 2 weeks. You scramble the cheese with clean hands in a large bowl and re-fill the springform pans without pressing too much to leave large holes. The next step is to flip the cheeses everyday and wait…This cheese will be ready in about 5 weeks total, but if you are patient enough to wait for another 2 weeks I promess you won’t regret it! It will become even stronger and sharper. I hope this recipe will prove it’s possible to make everything with plant-based ingredients. If you are not vegan yet, you don’t have to give up on cheese anymore! Serve this blue cheese alongside vegan camembert, onion chutney, grapes and you have one of the best vegan cheese platter! Quick note: If you are making vegan camembert at the same time, I recommend you keep them in two separated boxes. Please let me know if you try this recipe and feel free to ask if you have questions about the process! Update: Many people have been making this cheese without giving any credit back and labelling it as their own. I worked really hard to create this recipe and had to make a ton of experiments before releasing it, please give credit by tagging @fullofplants on Instagram or linking to this website. Please note: The links provided here for Penicillium Roqueforti may not redirect to a fully vegan product. If you want to find a 100% vegan one, you can get it on cashewbert.com if you are located in Europe. For the USA and other countries, I can’t give you a link as it seems harder to find, you will have to make your own research to find a vegan one. Be aware that non-vegan ones are grown on lactose, meaning it contains *traces* of lactose. Considering the amount used, you could still consider your cheese 99,99% vegan. It’s up to you to choose which one fits your beliefs best. Vegan blue cheese that tastes like the real one! Made using traditional cheese making techniques and only 4 ingredients. A creamy, sharp and strong cheese. Transfer the cashews to the bowl of a blender or food processor. Add the coconut oil and 5 tablespoons of filtered water. Blend on high speed, scraping down the sides from time to time, this step might take about 10 minutes depending on your blender. You should get a smooth, thick mixture. Open the probiotic capsules and add the powder to the blender. Add the penicillium roqueforti. If your penicillium roqueforti is in powdered form it works the same way as the liquid one. The mixture should be smooth but thick. If needed, add 1 tablespoon of water at a time until smooth. Do not add too much water, you want to use at least as possible. Transfer to a clean bowl, cover with plastic film and let sit at room temperature for one day, this step is important to let the cheese ferment. The following day, place the bowl in the refrigerator for about 4 hours to make the mixture easier to work with. After that, line a baking sheet or flat plate with parchment paper. Place 4 small springform pans on top (for each cheese I used two 3-inch cookie cutter rounds, stacked). Cut strips of parchment paper and lay them in 4 small springform pans. You want to cover the bottom and sides of the pan. You can also use plastic film if you prefer, the goal is to prevent the cashew mixture from touching the metal. Fill each pan with the mixture and press it down using plastic film so it doesn’t stick to your hands. Cover each cheese with a bowl, or plastic container. This step is essential to keep some humidity inside, it’s important for good mold growth. Place the cheeses in your refrigerator (you will age the cheeses covered if your refrigerator during the whole aging process). After 2 days, sprinkle salt over the top of the cheeses, and lightly rub with clean hands. Carefully flip the cheeses using a small plate and remove the springform pan. Sprinkle salt on top and on the sides, rubbing gently. You will only salt once. The cheeses will still be very soft but they will be easier to work with after a few days. Flip the cheeses every day, always use clean hands or work with a plastic film to be sure you are not touching the cheese. Mold should start to appear after about 7 days. After 2 weeks, scramble the cheeses into little pieces (just like when you scramble tofu) into a clean bowl. Lay strips of parchment paper in springform pans and fill each pan with the scrambled cheese, without pressing too much. This step is important to create holes inside the cheese, the mold needs to be in contact with air to grow. You can remove the cheeses from the springform pans right after shaping them. Place the cheeses on the baking sheet, cover with plastic box and place in the refrigerator. Continue to flip the cheeses every day for the next 3 weeks, always using clean hands or gloves. This step only takes a few seconds every day. After a total of 5 weeks, the inside and the outside of your cheeses will be covered with blue mold. They will be ready to eat! The longer you let them age in the refrigerator, the stronger the taste. The cheese will keep for at least 2 months in the refrigerator and will become firmer and sharper. The size of the pans have no real importance, use what you have on hand. I am in the process of making this cheese and am so excited. I am a bit worried because it did not bubble after being at room temperature over night. My Vitamix gets hot, and I worry that the heat killed the probiotic??? Mine didn’t bubble either. It did seem a bit lighter in texture when I put it in the springform pans though. It was a pretty thick mixture – maybe it’s too hard to make bubbles in something that heavy? Mine is not perfectly smooth, as I was also worried about heating it up too much while blending and scraping. I’m in the “refrigerate in the pans” phase now. Same here, crossing my fingers! Exactly, if your cashew cream is really thick you might not always see bubbles. You are on the right track if your cashew cream seemed lighter in texture. Dara, don’t worry if it didn’t bubble, sometimes it does and sometimes it doesn’t. I’m not sure why, it might be the room temperature, the thickness of the cashew cream, etc, but even if you don’t see bubbles, it will work. My blender gets hot too and I never had a problem with the cultures or probiotics. Thank so much, I’m having my long awaited blue with a glass of wine and it is amazing! I made your recipe 2 weeks ago with powdered penicillium. There is no mold forming yet. What can I do? Can I inoculate the mold on the outside afterwards?? I’m sorry to hear the mold didn’t grow, it’s all about the temperature and humidity. Did you keep the cheese in a box/container to keep some moisture inside? At what kind of temperature the cheeses were aging? Sometimes it can take longer to appear, especially if it’s too cold. A few times it took over 2 weeks for the mold to appear on a batch I made, but most of the time it will grow after just 6-7 days. Inoculating the mold from the outside is more suitable for camemberts where there is a rind, it’s different for blue cheeses since you want the mold to grow inside too. I hope this helps! is penicillum roquforte vegan ? Not all brands are, but yes there are some vegan penicillium roqueforti. I’m having difficulty finding vegan penicillum roquforte. The link in the article above goes to a product on Amazon that has milk in it. Sorry about that! I have to change the link regularly and sometimes they just change the reference…It’s true it’s not easy to find vegan penicillium especially in the US since most of the molds are made in Europe (France). I can’t find a vegan penicillium roqueforti on Amazon for the moment, it seems it’s not always available. This reference is vegan, if you can get your hands on some: PRB 6 HYP 5 D, from Choozit/Danisco. If think it would be possible to make a batch with non-vegan mold and then keep a piece of the cheese to add to a second batch, after a few batches your mold would probably be 99% vegan, but that would take several batches! 🙂 I will keep you updated if I find a website selling a vegan one. By the way, I also updated the link for the penicillium candidum to a vegan one on Amazon. Thank you, Thomas. Most of all, thank you for your experimenting and generosity in sharing your cheese making recipes and tips! After scrambling the cheese and adding back to the spongiform pan, does the cheese remain in the pans for the duration of the cheese making process? Wondering if it’s just until the cheese reforms and then remove the pans. Thanks! So looking forward to this. I’m salting the cheese tonight. You can remove the pans the following day, it’s just to reform them. Thanks Thomas, I’m so excited to try this recipe! Might you use blue cheese from the market to inoculate the cheese you are making? It’s possible, use about a tbsp of blue cheese instead of the penicillium roqueforti. Of course the final cheese won’t be fully vegan though. Thanks for the feedback! I’m really glad to hear you like your blue cheeses! The longer they age, the stronger the flavor! How long can you age it in the refrigerator for? I just finished the leaving the cashew mixture out for 24 hour stage. Thank you for this awesome recipe. Can’t wait to see the results! You can age the cheeses in your refrigerator during the whole process, it’s actually recommended if you don’t have a cellar or cold room. Yes you can use rejuvelac, no problem. Hello, if I use rejuvelac instead of probiotic capsules, do you know how much quantity should be? Yes, just replace the water with rejuvelac. First of, thank you for the wonderful recipes, I’m in the process of making both the Camembert and blue cheeses for the first time! I was wondering why you recommend keeping them under separate boxes? I have such a tiny fridge (and no room in my apartment that has the required temperature) that keeping them under separate boxes is difficult. Is this essential? Many thanks! Yes it is essential, molds transfer very easily from one cheese to another one, so if you don’t want blue mold on your camembert I recommend keeping them in seperate boxes and always use different gloves when flipping them. It all depends on the aging conditions, usually after 2 weeks you should already see some mold growing, but if the temperature is too cold it can take a bit longer. Hola consulto soy de argentina si saben de donde conseguir el Penicillium. o si alguien lo compra via web. si alguien sabe le agradesco. saludos. Recomiendo consultar en Internet para tiendas o empresas en Argentina que venden ingredientes para la fabricación de quesos. Se fabrican quesos tipo roquefort y gorgonzola en Argentina, así que debe haber algún lugar que vende las culturas necesarias para hacerlos. Si no sos integrista en el veganismo, podrías comprar un pedazo pequeno de queso roquefort legítimo y tirar unas partes de las venas azules para mezclar en la receta de tu queso vegano. La cultura es viva, así que debería funcionar. Si eso rinde un queso azul que te guste, guarda una parte del nuevo queso para mezclar en futuras recetas y así en adelante. Rob, I can read a bit of Spanish and I believe what you have asked or suggested is that if you cannot find the proper bacteria could you use a small portion of a blue cheese to use as a starter with the nuts. That is what I did and the cheese came out fabuloso. Hace 30 y tantos años que vivo en Barcelona. Soy vegano de hace tiempo pero no soy fundamentalista, no kosher no halal… Simplemente soy vegano por una cuestión de salud y criterio alimentario. El P. roqueforti o el P. camemberti son organismos vivos, de modo que no llevo muy lejos la cuestión de si han estado en contacto con productos animales o no. Los cultivos que he comprado y que uso seguramente proliferaron en medios animales, pero he entendido que el hongo, puesto en un medio propicio no animal, acabará siendo vegano en esencia ya que si se alimenta de un medio vegetal, los rastros animales quedarán lejos, y cada vez más lejos si retiras venas para hacer nuevos quesos. Disculpa el chascarrillo pero procede. Me parece que rigideces semejantes llegan a distorsionar el puro sentido común. Defiendo mi de isión de ser vegano pero no quiero perder el norte de una sensatez responsable. Thomas, you are heaven sent! I just tried one of my cheeses last night — and two of us finished it. The texture was perfect. The flavor was a delight. I’ve missed blue cheese. And now I don’t need to miss it anymore. It was so delicious. I have three left. I am saving one to be my starter for the next batch. You may or may not recall that I used a piece of roquefort cheese as my starter with the idea that I am going to do 3-4 successive batches and hopefully “clear out” all the dairy. We are thrilled. I want to share it, but I want to keep it. Anyway, today is five weeks and two days. I can’t imagine how three months will taste. I will start another batch this weekend. And I will attempt the camembert in the same way — with a piece of camembert starter. Patience is worth it! I agree, it takes so long to age and then it’s gone in no time 😉 Good luck with your camembert! Thank you ever so much for the time, expense and determination this evidentally took to perfect these recipes. I cannot begin to appreciate the detailed scientific labeling and logging of information this has require to make it be successfully reproducable. Again, my hats off to you!!! Thomas, what is your background and what motivated you to do this? Have you looked into into providing widespread manufacturing and distribution of the end products? You shoul please! Technical question: I have an Excalibur 9 drawer covered door dehydrator with adjustable heat setting from raw and ambiant air temperature 95° / 35°c –all the way up 155°f/68°c. I could use for controlled fermentation/storage while proofing. Have you any information on this being helpful in this processing? I’m not interested in producing and/or distributing vegan cheeses, I just like to make them as a hobby and share the recipes with everyone. Regarding the dehydrator, I never tried but since the culture is a mesophilic type, it doesn’t require too warm temperatures to work. It’s always working for me at room temperature (taking 24-48H), but if you want to speed up a bit the fermentation I would recommend to let ferment the cashew cream for 8-10 hours at 35°C. If using thermophilic cultures, then the temperature will have to be slightly higher, around 55°C. I am truly thankful for you! I just became vegan and it’s because of awesome replacements that it works for me. Cheese was a deal breaker until I tasted vegan nut cheese. I thought I’d never be able to have blue cheese again but I’m stoked. I started mine tonight! Thank you for your talents and time ! My blue cheese is about three weeks old. It has beautiful lovely blue mold all over it. I scrambled it a few days ago. I tasted it and it doesn’t taste much different. Or optimum ripeness ( I like it stinky). How much longer should I age it? I’m patient. This is normal, you should age your cheeses for at least 5 weeks, and even more (2-3 additional weeks) if you want a strong blue cheese. Orange mold is not good, especially if they smell “strange”. I would recommend trashing them and starting over. If some of them have no orange mold, then separate them from the “contaminated” ones and wrap them in cheese paper. Next time, try pouring boiling water on the cashews and let it sit for 1 minute. This should kill some bad bacterias. Also, use gloves when handling the cheeses if possible. Oh you wonderful person! I have been so waitiNg for This! I will have to take a look at that cheese 🙂 My next one will probably be a washed rind cheese. The news just gets better and better! Gosh, I’m so hyped! I hope my penicillium will arrive soon so I can finally start my first Camembert! oh my gosh this is the most incredible thing i’ve ever seen. you should go into business!!! They are alot of work to make so while I love having the recipes if you made them ready to go I would purchase. The penicillium roqueforti is manufactured by DuPont, which is a huge chemical company. Are there products organic and plant based? Is there a way to check? I’m used to making raw vegan cheeses but with more natural ferments like rejuvelac, kefir etc… so i’m a bit concerned with the quality of the ferment. I’m not sure about that, I don’t think it’s possible to find penicillium roqueforti labelled as organic for the moment (but if you find something, let me know!). The one I’m linking to is the exact same product and brand I bought from another website that labelled it as vegan, so this mold is vegan. Penicillium roqueforti used to grow on rye bread in caves, but I’m not sure how it’s made today. By the way, you can replace the water and probiotics with rejuvelac, it will work. Hello Thomas O great one! I love your work! I want to try this recipe, but it was a broken link for the Penicillium roqueforti. Do you have the link from where you ordered that was vegan? Thanks! The link should work now. Hi Thomas! If I use rejuvelac and replace the water and probiotics, how much rejuvelac should I use? 3-4 tablespoons of rejuvelac should work. Use the rejuvelac in place of the water. Isn’t rye bread mold what is believed to have caused all the “witch” trouble in Salem, Massachusetts? If I remember correctly I believe the article I read many years ago said it was how LSD is made! LOL Just thought I’d throw this out there, I do want to give your recipe a try, I’ll take my chances with the mold but if I get arrested for dancing naked under a full moon I’ll be directing the police to you!!! I have never heard of this story, sorry! So I can’t give you an advice on how to make LSD from blue cheese 🙂 But I know that penicillium roqueforti is safe. Holly guacamole!!! This just blew my socks off! Looks awesome!! I love your cheese recipes, must get some of the ingredients and give it a go! Yummo. Congratulations Thomas! This is such an achievement! It looks fantastic, It is the first vegan blue cheese I ever saw. Will definitely give it a try! Thank you so much for sharing!!! After making your fabulous Camembert I can’t wait to try this one. Thank you so much – you are a star. I add my delight and thanks like all the people who have commented above, Thomas! I knew you were working on this process, and so I ordered my penicillium roquefort in hopes it was coming, I’m SO excited to give it a try! You are really great to share all these recipes, you are brining something new and wonderful to vegans. Thank you! Hi Thomas, how much of the penicillium drops do we need to add? In the recipe, it just says to add it. Thank you so much! Hi Monique, I’m not sure about drops but I would say 6-8 drops. As much as needed to fill 1/8 tsp as written in the ingredients. The data sheet I received along with the Penicillium Roqueforti says you can store it 12 months at -16C (3F) and 2 months at 4C (39F). Do you think repeated freeze/thaw cycles would hurt the culture’s viability? I might repackage mine into smaller quantities before freezing so I can use it a little at a time. I am so looking forward to this as soon as my mini springform pans get here. Scrambling the cheese to aerate is such a great idea! I have been using the same penicillium for over 5 batches. I let it defrost in the fridge, use what I need and put it back into the freezer, I never had any problems! This recipe is genius! I have to try it (and the camembert!). I just have to find the penicilium in France, but we are suposed to be the cheese country, so >I hope i’ll find it easily! Can you tell me if you succed in this search? ^^’ I’m frensh too and looking for Penicilium..
Do you think this would work with a different nut, maybe macadamias or almonds? Yes, I think it can work with other nuts. If using almonds, make sure the skin is removed. The texture might be a little bit different though, cashews are really soft and blend while almonds are harder. Macadamia nuts are more expensive but would probably be the best alternative. Hey Thomas, thank you so much for sharing this recipe. I have just made the cheese today, one version with acidophilus, the other one with rejuvelac. I am curious to check the difference in taste, since I’d rather use rejuvelac (much cheaper than commercial probiotic). Can’t wait for the results! 🙂 Cheers! Hi! I just ordered the penicilium candidum for the vegan camembert and I’m really excited! I am definitely interested in trying out the bleu cheese once the camembert experiment is complete. Good cheese is one of the most difficult things I’ve given up- way harder than meat 🙂 Are you working on any more types of cheeses? I’m so impressed with and grateful for the work you’ve put into these recipes! Yes, I plan to work on washed rind cheeses really soon (as soon as I get a refill in cashews!) and several other recipes that uses vegan cheese. Stunningly looking cheese. I have just ordered the penicillium roqueforti culture. The supplier is wholesale, so I was forced to take the amount of it enough for 500 liters of milk! Anyway, the price was 32 euros, so isn’t so painful. I am not totally vegan, but do not consume meat and I am allergic to dairy protein, so have to look for other options. Hope, this cheese turns out good. Thank you for sharing the recipe! Thanks Vytautas! You can store the penicillium in your freezer and it will keep for a loooong time so you will be able to make a lot of cheeses in the future 😉 Feel free to keep me updated! Yes there are other choices, some in powdered form, others in liquid form, both work. There are many different molds, some are slightly stronger than others but I always used the same bottle so I can’t give you much information about the differences. Thomas, is the temperature for ageing the blue cheese the same as for the camember? I recommend aging the blue cheese in your fridge, in a box to keep some humidity. This way they will be more creamier than if you age them at a higher temperature. i don’t have a box per se i am covering it lightly with plastic wrap. i don’t see a lot happening after almost a week did i ruin it? what kind of box do you use can you post a pic of it? Do you have a tupperware box/container or something similar? I would not recommend covering the cheeses with plastic wrap, they need to be in contact with the air. I don’t think they are “ruined” yet, wait at least another 7 days (with the cheeses in a container, with no plastic film touching them), depending on the temperature of your refrigerator the mold can take longer to appear. Good luck! ahh i do not have a tupperware that will fit all three cheese in a 4″ mold, but i can do that now since i still have to squish them in a few days. thank you for your advise. i will try to buy something that will fit in the fridge and fit on the cheeses. my plastic wrap is loose tho.. Does it matter what kind of salt I use? I know that cheesemakers use only non-iodized salt. They say, iodine has a destructive effect on cultures. Thank you. I don’t think the kind of salt you use really matters that much. I used table salt and had no problem at all! Sea salt works too. Thank you! I will start my “first batch” when I receive the mold culture. By the way, excellent photos. I myself am a photographer, so have to say – you have a good taste as a photographer also! You should be selling this there is a big market for these vegan dishes. How exciting! I can’t wait to give this a try, but probably not until the new year as I won’t be in one place for long enough until then. Thanks for the recipe! I have heard it is possible to use the same mold cultures you used here (Penicillium Roqueforti) to make Gorgonzola. Have you ever thought about trying something like this or have you even tried it already? I thought maybe you had an idea how to do it? I suppose I would just let it sit without scrambling it and maybe removing excess mold? I never tried Gorgonzola, and I’m not going to now 🙂 but from what I read, Gorgonzola is a kind of blue cheese. What makes it special is that it’s made in a specific area of Italy. If you don’t scramble the cheese, or pierce it, you won’t get the blue veins inside. You can definitely scrap the sides if you want the exterior to be white. My little cheeses are on day 6, and I see a faint blue tint. It’s very exciting! I’ve been flipping them by putting a little piece of parchment on top, flipping it onto that, then leaving the parchment under it until the next night’s flip. That seems to work really well. I’ve gone almost 10 days and no sign of mufa! What am I doing wrong??? It smells like blue chees there’s just no blue! Wait a bit longer, sometimes it can take up to 20 days before blue mold appears, it really depends on the aging conditions. Ugh! I just scramblednit up in hopes that it might mold. But holy Hannah! It tastes just like blue cheese! You’re a god! Thanks Thomas for sharing this recipe and the camembert!! I ordered the pencillium and can’t wait! I will use rejuvelac instead of the probiotic capsule. should still be nice? You’re welcome! Yes rejuvelac will work well! I’m trying out this recipe for the first time and would like to ask a quick question. When you get to the stage of taking the cheeses out the moulds after two days and salt them daily do you then keep them in the fridge back under the plastic box or leave the box off? Sorry to be a pain but I have another question. I’m on the 2nd day of the salting process and noticed the cheeses are sitting in a puddle of water (due to the salt I assume) and the cheeses themselves are very wet. Is this ok? I did put the plastic box back over them in the end and they are sitting on greaseproof paper, maybe I should sit them on kitchen towel to soak up the water?. You only salt them once right? If you have too much water in your box, yes use a clean paper or kitchen towel to soak up the water. Be careful, you don’t salt them daily! You salt them once and then flip them daily. Yes I keep the cheeses in the fridge at all times, in the plastic box. Doh! I misread and though you had to salt them every day for 2 weeks (thought that’d make them rather salty). Phew thank goodness I asked. Thanks so much for getting back to me. Me too! I salted for 3 days! Do you think the mold will still grow thomas? Do you mean we would need to keep them inside a box or we need to put them on a rack and cover them with a plastic box? I’ve had the camembert on a rack covered with a box and nothing has happened (probably because of the temperature and 2 days of salting). About the blue cheese, I have it on a rack but without a cover and there is no blue on it either and it is dried on the outside 🙁 Do you think the mold will still grow besides the edge being dried??? Camembert or this Blue cheese can be made with different nuts. I’m thinking blanched ‘hazelnuts’ just because they grow in our area. Or even pine nuts. I also have a bit of a sensitivity to cashews. I know hazels are strong-tasting, but perhaps pine nuts can work…I would love your thoughts. I always made the cheeses with cashew nuts because I bought a huge bag of raw cashews 🙂 I think it would work with hazelnuts, but the taste would not be as good since, as you said they have a strong taste, even blanched and raw. Pine nuts would work better, their taste is very subtle and they are pretty soft so they would blend well. It would be a lot more expensive to use pine nuts though. I never tried to strain out the “fiber” of the nuts, and I’m not even sure if it’s possible since the nut cream is already very smooth. If you remove the solids from the nuts, I guess you will be left with something that is very liquid, and it will probably never firm up. If you are trying to make a very creamy cheese, you could add a few tablespoons of refined coconut oil, but in my opinion the cheeses are already pretty soft and creamy. Thanks so much for you’re reply, Thomas. You arejust amazing. I would love to see you experimenting. You have so far my best vegan cooking blog !!! I already taste your vegan camembertrecipeand the flavour is great but i can´t really get the rind you make in yours. Here in Berlin i can´t find the penicillium in drops and by mixing 1/8 of tsp of penicillium powder in 10 tablespoon of water i can just make 8 cheeses and not really getting the rind. Am I doing something wrong right? Thanks so much for your patient!! Are you aging the cheese at the right temperature? When did you start your cheeses? The rind takes some time to appear. If you don’t have the rind you are missing a lot, the flavor is totally different. Let me know how it goes. Finally, I received the penicillium roqueforti culture. I was shocked to find out it is an amount meant for 10000 liters of milk! Now it is in the freezer. But I still wait for my ordered springforms to arrive, so cannot start the cheese as yet. By the way, have you given a thought of trying to make Feta cheese? I used to love it when many years ago. Or do you think it is hardly possible to achieve its taste with nuts? Well, it is a company (Baltvita) in my native country Lithuania. You can google for it. But I do not think it supplies to other countries, though. Your recipe looks awesome! The link you provided for the penicillium roqueforti no longer exists. Do you know of any other vegan sources for the product? I’ve tried looking around and I’ve only found ones with dairy included in the allergens list. Thanks in advance for your help! Hi there, firstly thank you for such a lovely blog, your photography skills are amazing. Like a lot of people I struggle with cheese and so have made my own dairy cheeses in the past so was so excited to find this recipe. I actually have a microbiology background so very interested to learn more about nut / soy cheeses and how their macro’s interact with traditional cheesemaking elements. You may want to include some other cheesemaking elements too – I’m experimenting with lipase at the moment which is definitely adding to the complexity. Im keen to learn more about the salt ratios required to favour only lactobacillus – better for food safety. One question – did you blue ever look fuzzy like a tennis ball? You didn’t show any pictures of that but mine had a big blue bloom until I broke it up and waxed it. I never heard of lipase, sorry. Yes the blue (and it’s the same for the camembert actually) looks fuzzy at first, but since you flip them everyday, the rind becomes flatter and after a few weeks you don’t see the “hair” effect. As long as the mold growing is blue/green you are on the right track, just leave them. Hi, Thomas! Thanks for recipe from cold Siberia. It’s great idea to make real blue cheese, not fake. We almost made blue cheese. We want to know, what is the flavor. Is it really like blue cheese? And before blue mold, there is white mold. Is it OK? Yesterday, I removed my cheeses from the springforms. They are in nice shape already. But the smell! The fantastic smell that I remember from the days I ate those cottage cheese sweets glazed with chocolate (they are very popular in our country)! Well, I cheated a little, actually. As I said, I am alergic to dairy protein, but I do consume ghee (melted butter), which has all dairy protein removed in the process of melting. So, I used this instead of coconut oil. And, actually, 5 spoons of it and only 3 spoons of water. I do not know, maybe this has some impact on the smell also. But it is really fantastic! And one more thing. I added additionally some mesophilic culture, which is used for making soft cheese. Maybe, this also has an impact. I’m so glad to hear that! 🙂 Yes mesophilic culture has an impact on the taste of the cheese, it is usually used in the making of blue or camembert cheese to add a subtle buttery flavor. I did not use it here because I have no links for a vegan mesophilic culture yet. Good luck for the aging process! This looks fabulous! Can this be made in one larger spring form pan? I already have 6″, 8″, 9″, 10″ and 12″ pans. I really want to try this cheese but don’t want to buy any more bake ware. Sure, the size of the spring form pan doesn’t really matter. This looks amazing! I have food intolerances and cannot have cashews 🙁 Would pine nuts work in this recipe? I never tried with pine nuts (mostly because they are super expensive), but I think it would work. 3 weeks into the culturing process and I have no blue growing on the cheese. Otherwise my cheese looks beautiful. I am wondering if the culture I purchased that you recommended got to hot in shipping. I will have to try again. Thank you for sharing. I hope my blue starts growing soon. I will keep on watching and waiting. Are your cheeses stored in the refrigerator in a box? The mold cannot grow without some moisture. It can take longer to appear if your fridge is too cold, but 3 weeks and no mold is not a good sign unfortunately. About the culture, I’m not sure it really matters if it was “hot” when it arrived. I recently brought a bottle of penicillium candidum to a friend and the bottle stayed in my bag for a day. It still worked, just make sure to store it in the freezer when you are not using it. Yes, they are wrapped in cheese paper. Stored in a plastic box. There is moisture in there. I can see a few beads of it when I check it out. The penicillin is stored in the freezer. That’s a nice christmas present idea! 🙂 Your friend won’t be disappointed! You don’t have to use a metal pan, you can definitely use a glass or plastic pan/dish. Make sure to line the sides and bottom with parchment paper or plastic film so it’s easier to remove the “cashew cream” from the pan (it’s a little bit sticky at the beginning but firms up after a few days). It’s just to shape the cheese at the beginning, then they are aged without the pans on a baking sheet, in a box in your refrigerator. Hi Thomas. Thanks for getting back to me and for clarifying that. That was the only step I was struggling with so much appreciated! Hi again. So everything is going to plan. I started to see blue mould after a week and scrambled the cheeses after two. The only thing is, some of the mould is like a round, fluffy ball on the outside. Is this normal?? When does it start to form a rind like in your pictures? Sorry about the questions, just want to make sure I’m on the right track! I’m not sure what you mean by fluffy ball? You are only at two weeks, the rind will form but you have to be patient, I would say in 2-3 more weeks you should have a nice rind. Be aware that the rind is not that important, as long as you have blue inside the cheese the taste will be there. Also, it’s possible to get a rind that forms more quickly by not scrambling the cheese and only piercing it, I talked about this method in the article. In my opinion it’s still better to “scramble” the cheese to have more holes inside and have a better mold development. Does the probiotic used have to specifically be the one suggested or can I use a probiotic blend that I currently take myself? Not at all, most probiotics will work, just use the one you have on hand, you can even use rejuvelac. I’m SO glad to hear you enjoyed your blue cheeses! 🙂 Thanks for the feedback James! If there is mold, you are on the right track! Yes the mold should be white and blue/green with some variations of color, it sounds good 🙂 Don’t worry if more blue mold cover the white after some time. As long as there are no pink mold it’s okay. Hi Thomas, I am so excited to be trying this recipe! Everything was going very well, until I checked it this morning [it has been fermenting overnight]. There are pink mould spots across the top. Does this mean the batch is ruined? That doesn’t sound good…Pink mold is bad mold, I’m afraid you cashew cream has been contaminated and it will probably smell like ammonia very soon. I would recommend making another batch, make sure everything is very clean, use latex gloves if you have some, and don’t place the cashew cream in a room that is too warm. Hi Thomas! I got very pink dots on the surface of my cashew cream cheese.. It happend twice, the fisrt time I throw it out but this time I’vr only removed theses pink little dots and there’s no bad smell… I always put some salt on the top e a pinch in it.. can this be some kind of reaction with the probiotics or is this really bad bacteria? Hi Waleska! As long as you removed them and the smell is pleasant there is no problem. I wouldn’t recommend putting salt on top though, it creates moisture that stays on the cashew cream for hours at room temperature, this might be what creates that pink mold. You should only salt the cheeses after the fermentation process. Good to hear you are still among us! Thanks for sharing the article, interesting. I’m not sure it’s because of the probiotic though as I used acidophilus many times and got pink mold only once or twice out of many batches. The mold started appearing on the 7th day as you said, about a week ago. This Saturday was the 14th day already, so I “crumbled” my cheese and packed it back by pressing very lightly. I say “crumbled” in quotes because it is so creamy it does not crumble. I nipped it into small pieces. Everything so far is plain excellent. The smell, the creaminess, the look of the greenish-blue mold is stunning. Think you very much once more. Great! Yes it’s not exactly crumbling, more like making very small pieces and reforming the cheese into the pans without pushing too much. what culture did you use to get your results? Hi there! I am currently trying out both this recipe and your camembert, and because our kitchen is always so hot I am aging them in the fridge in tupperware containers. They are sitting on parchment paper as I rotate them each day and there is a lot of moisture. Should I change out the paper and dry the interior of the container? Waiting game is tough haha! Thanks!! Tupperware container are great to age the cheeses, especially the blue one that requires a little bit more moisture. Yes I recommend you change the parchment paper every two day (for the first week or so, until the cheeses become firmer) and dry the interior of the boxes with a clean paper towel. You don’t have to do this everyday, just when there are too many water drops inside. I posted earlier that the cheese culture did not work out. The blue didn’t grow. I think the penicillin culture is no good. I continued to age the cheese hoping. Nothing. What I did find is now that the cheese has aged longer, I can grate it. It makes the most beautiful grated cheese. It also slices and holds its shape well. I wish there was a way I could post photos. My flop ended up being a success. do you think your culture was old? or you did not process it correctly? mine is powder so i followed directions. Thomas, I’m at day three of flipping the cheese and the exterior is very wet. I have it on parchment. The inside of the plastic box is dry. The cheese seems to be getting firmer though. Do I salt the cheese every time I flip it or just on the first day? Thanks for your help. i put mine on parchment today and found a plastic lid like you said. Rose, i am not salting every day, just that one day it said !! arrrrgggghhhh. i am not seeing any blue, green or veining. The cheese itself is ripe and yummy like a camembert but i don’t want to start a new batch of blue until i find out what went wrong. anyone else? i am using the powered culture from Cultures for Health from Amazon. could it be old? should i use more? Hi there! 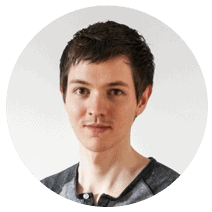 I think I’ve skimmed the comments thoroughly, but my apologies if I’ve missed you answering this already: Could you tell me a little bit about the daily flipping? I’m just wondering about its importance, and what to do if I go away for a few days and won’t be around to flip (say, at Thanksgiving time). Is it crucial to do it Every day? The flipping is a lot more crucial for the camembert cheese since you want a uniform white rind. It’s not as important for the blue cheese since the blue mold will grow in the openings, inside the cheese. I still recommend to flip it regularly to make sure the cheese has the same texture everywhere (if you don’t flip it at all there are great chances the cheese will be moist at the bottom and dryer at the top). It is totally okay though if you forget to flip it for 2-3 days, it won’t have a negative effect on the outcome, don’t worry. Great! Thank you for the information! Hi Thomas! I am happy to report that after six weeks, I finally broke into my blue cheese (I just did one large round instead of 4 small rounds), and it was AMAZING! Myself and several non-vegan friends enjoyed it with wine for a vegan cheese night and we were all thoroughly impressed. I will be starting another batch soon to enjoy in another 5+ weeks. It is worth the wait! That’s awesome! I’m glad to hear you loved the blue cheese 😉 I agree, definitely worth the wait! I would recommend making several batches so you can age some of them for up to 3 months. I am wondering if my fridge was too cold (i think it got down to like 40 something), and that the mold stopped growing. Ever since i scrambled it the mold has not grown and its barely on there compared to got it covered the outside initially. What can i do to fix this? Can i put it in a bit warmer area (50 something) and buy normal blue cheese to get it going again? I have the powdered mold and i dont know how i would go about spraying it on the outside…. 40°F is definitely too cold. You should aim for about 46-50°F. Please be patient, it takes time for the mold to grow again on the outside. Actually, you don’t even have to wait for it to grow on the outside (except for the look), sometimes I wrap my cheeses 1 week after scrambling and age in the refrigerator for another 7-10 days. They taste delicious and are still mostly white on the outside. No need to spray again, the mold is already there in your cheeses. Hi, has anyone here successfully made this cheese (i.e. The mould has grown as it should) using the powdered mould? My first attempt with the powdered mould was a failure, but I over salted the cheese so that could have been the reason. I’m going to try again using the same batch of powdered mould. I’ve seen others mention they’ve had no mould when using powdered but no one say they’ve had success with powdered mould. Hi Adriana, Yes I have had success with powdered blue mould. I didn’t soak it either, just added it to the blender. If it was possible I’d add a photo but I can’t see how to do that. My first batch was ruined y hot weather, (but not by lack of blue mould growing) so I bought a small camping fridge that can b adjusted to 10 degree C, and I had success then. Thanks so much for the info and good to know it’s worth giving it another go with the powdered mound. maybe that is a clue Adrianna, don’t soak it just put it in. Berylvt did you also add the 5tbsp of water? Hmm, now i have to make a decision. I’m about to blend the ingredients, I have the soaked mould in the fridge. Do I use it or try the straight powdered mould? As we now know the straight powered works I may try your method Berylvt. I’ll let you know here if the mould has grown in about a week’s time. Fingers crossed. I did not add extra water because I used the powdered mould. I only added enough water to make the cashews creamy, as little water as possible actually. i am right there with you. i had no mold very expensive and very disappointed. i will try again also but ya know if its not going to happen i don’t want to keep waiting 2 months for nothing. the cheese is yummy like a strong brie or camembert but i need to know what is going to come out before i start to sell it. Just thought you’d like to know it looks like my second batch of blue cheese is a success. Spots of blue/green mould started appearing exactly on day 7. Hooray! This time I used Berylvt’s method of sprinkling the powdered mould directly in the blender with rest of the ingredients. I’ll let you know how the rest of the process goes. Yes I did add the 5 tbsp of water as I thought the mix would otherwise be too thick to blend. The mixture came out the perfect consistency once blended, not too wet at all.. Liquid or powdered, it works the same, no one is better than the other. Do you store your powdered mold in the freezer? Thanks Thomas, I’m still thinking it was the over salting which stopped the mould growing the first time. I now have a new batch fermenting today. Yes I keep the powdered mould in the freezer. I did wonder though if my probiotic was active. I’ve using acidophilus capsules, but they are not keep in the fridge nor does it say anywhere on the bottle to keep them in the fridge. No problem with the acidophilus capsules, I also keep them at room temperature and they still work great. I don’t think you have to keep them in the fridge. I really hope you will have success this time with your cheeses! I know how frustrating it can be to have no mold growing (It happened to me when started working on these recipes due to many things like wrong aging temperature, using tap water, etc). The worst was when I aged my cheeses in a garage and forgot to cover them one day…well the mice had a great meal. Hi Thomas. I am currently aging my cambembert and have just started the blue cheese. I had a question – when you crumble the cheese back into the springform pans, are they meant to remain in the pans the remainder of the time? Thank you for this amazing recipe. I’m really looking forward to this experiment. That’s a good question, I forgot to give this information in the recipe. No they are not meant to stay in the pans. Since the cheeses are already firmer than at the beginning you can just remove them from the pans when you have shaped them or wait until the next day. Thanks Thomas – I’m sure that may be an obvious answer once I am at that point, but thank you for clarifying! I’m at the 2 week mark and just re-packed the cheese, I was happy to finally see some green on the surface. My cheese was too moist to crumble, so I just mixed it up a bit and packed it lightly into the spring-form pan. I didn’t add much water when I first made the cheese, so I’m curious as to why it might be so soft, almost like it just came out of the blender on day one. I’m going to leave it uncovered in the fridge to see if that helps. I do like the flavor, so I’m hoping the texture improves over the next three weeks. Awesome, you are on the right track! When I mean “crumble” it’s more about making small pieces with your hands and pack it lightly. Blue cheese is meant to be softer than other cheeses, you want that creamy texture. It will firm up more in the next few weeks, don’t worry. Whew! Thanks for the recipe and advice! It’s been 5 weeks and I finally cut into the cheese. It has a few spots of mold on the exterior, but no veining on the inside. It has a blue cheese taste, but it’s very salty to the point that it’s almost not edible. Have you ever measured the salt before sprinkling? I’ afraid that “sprinkling” can be very subjective and in my case may have ruined the cheese. I think I’ll start the process again and try measuring the salt. You only salted the cheese once right? I never had any problem with a too salty cheese, I would say I use about 1/4 tsp salt on each side (depending on the size of the cheese obviously). If you have no mold on the inside it’s because the holes were not large enough. Thanks for the clarification. I know I used more than 1/4 teaspoon of salt. When I first made the cheese I thought I had to salt it every time I flipped it and salted it on day one and two. I also didn’t understand about pressing the crumbled cheese into the mold. I hope I can master the technique because the cheese tastes good even though it’s salty. If you salted it twice then that’s the reason. Regarding the “crumble” part, I meant making small pieces of the cheese with your hands (the size of an hazelnut for example) and pack it into the mold without pressing too much to keep some air between each pieces. If you have trouble with this part I recommend you skip this and pierce the cheese instead, use a clean skewer and pierce it many times everywhere (I would say about 50 times), it can be horizontally, vertically, etc it doesn’t matter. This way you will have holes inside the cheese where the blue mold will be able to grow. I hope this helps and your next batch will turn out better! I’m starting my next batch today. Thanks for your help! Five weeks for my blue cheese ended last Saturday. So, we and my wife had a little taste party. Invited a friend also, she is not using dairy for health reasons. Both look and taste surpassed all our expectations. Simply brilliant! For the next batch, I’m going to triple the number of cheeses. Also, your camembert is on the list for a test batch. Thank you exceedingly!!! That’s awesome! 🙂 I’m so happy to hear you enjoyed the blue cheeses, that made my day! That’s such feedback that pushes me to work harder on vegan cheese (and non-cheese) recipes! I would recommend to make several batches instead of tripling the recipe (making one batch a day for example), it’s safer because it can happen that the cashew cream turns bad during the fermentation (at day 2), if it happens you won’t waste too much cashews. I had this problem a few times, it can be because of the water, or a too high temperature in the house. Good luck, and let me know when you make the camembert! Hi Thomas. My blue cheese has been ageing nearly 3 weeks and still no spots of mold, but it’s definitely not gone bad. It smells and tastes amazing, and is getting sharper as it ages. Do you think it’s definitely too late for any mold to appear? 3 weeks and no mold is not a good sign and I doubt it will grow now. I’m not saying the cheese will be bad to eat but it means you won’t find the taste of blue cheese. Humidity is important for penicillium roqueforti to grow, are you aging the cheeses in a box in your fridge? Did you salt them at the beginning? Salt also helps the mold grow. Kathy, like me, you will have a hell of a time trying to get vegan culture in the USA. If by some slight chance ( i have talked to everyone but GOD ) you do come across some or you find an outlet for a vegan culture, please get in touch with me asap. wgrossman at hvc dot rr dot com. Honestly I have no idea, but I guess the temperature and humidity of your country will have some effects. Since you are living in California and probably have a refrigerator you should be good, both cheeses can be aged in a fridge with no problem. Thank you for taking so much time & patience to answer all these questions, it’s really amazing you are so dedicated to make this recipe work for everyone. I have had the blue cheese in my fridge for 9 days now. It looks and smells very good, but there is no mold yet, would you recommend maybe to pierce it with a skewer? Or should I just wait a few more days and scramble everything together? No problem! Depending on the temperature and humidity the mold can take from 7 to 15 days to appear. If no mold appears in the next few days I would mix one tablespoon of filtered water with 1/16 of penicillium roqueforti. Transfer the cashew cheeses to a large bowl and mix them with the water. It will make the cashew cream a little bit softer and increase the aging time, but at least you will give it more chance to grow blue in the future. Then transfer the cashew cream into your springform pans (or whatever container/mould you used). No need to resalt them. Once they will be firmer (I guess after a few days), then make small pieces and lightly pack them into the springform pans to leave some holes, or pierce the cheeses with a skewer. Both methods work, the first one yield a better visual inside but taste will be very similar. is there a risk of producing mycotoxines during the culturing process with the penicillium roqueforti or the penicillium camemberti ? Especially in combination with the nuts? I am from Germany and a read about that. thomas i am trying a new batch. on day 4 i put the culture right into the blender this time and used filtered water, not tap water. i got my plastic box, the cheeses are a bit on the wet side but i have high hopes. one question. is the salt for taste or for the rind to grow? Well, salt is essential to develop a nice rind and kill bad mold. It also helps a lot with the flavor. lol i don’t know why i said i cultured on day 4 , I salted. i use this very course salt from greece. i might get some regular kosher salt and do it again. I see another post where you suggested adding more culture if the blue does not appear. i will keep that in mind. by the way even tho the blue did not appear, my first batch had a stunning flavor. we are calling it barely there blue. Wendy, I squished/crumbled one of my blue cheeses that didn’t form mold (they had fermented well and smelt great so I knew they weren’t off) with part of a new batch that did. They aren’t going moldy all over the outside but are moldy on the inside like the real deal and taste amazingly like it too. Amazing recipe, Thomas! thanks lady….great to know. monday is day 7 i will give it to day 14 and if i have no mold, i will re-blend with more culture. if that does not work, i am going to think that my culture is off. ??? Just wanted to thank you Thomas for this wonderful recipe. I had my doubts that it would be as easy to make as you suggest and would taste anything like the real thing, but it is easy and tastes amazing. I’ve just had my first taste at the 5 week stage and it tastes just like a ripe Gorgonzola. I added a little more salt at the crumbling stage as I thought then it was a bit bland for me, but then I have a salty palette. I will be maturing the other two cheese the extra two weeks as recommended. I now know they will taste out of this world. Thanks again for doing the hard work of experimentation for all us blue cheese craving vegans. Thank you Adriana for the kind words! 🙂 I’m so glad you liked this recipe!! If you are patient enough you can let them age for a longer time (3 months for example), they will become stronger in taste. 3 months, wow. I’m about to make a second batch, I’ll see if I can put some aside for that long. Will vegan cheese made like this melt too? Thomas, ok so with my second batch i did not get the veining , again. i just added more culture and blended it. and put it back in the fridge. i am using your method of Tupper ware and the mixture is very wet. is this OK? also i am starting to wonder if my culture is off? i went to an online store the cheese maker and they offer the culture in, PA, PS, and PV> what is the difference and will either or all of the work? thank you in advance i know i am a pain but i am determined to make this work. Since how long your second batch is aging? I’m not sure what you mean by “very wet”, it should have the texture of fresh cheese. It should be soft but still holds its shape. The penicillium roqueforti, if in powdered form should be rehydrated with some water (something like a tablespoon) before adding to the blender. It’s better to do this because the mold is uniformly distributed. PS, PA and PV are different kind of penicillium roqueforti. Some are stronger in taste than others, and some are growing faster. For example, the PV and PA molds are growing faster than the PS and have a stronger taste in the end. Hi Thomas, second batch day 2. i did not keep it out for a day i put it right into the fridge. The first batch was done as instructed with the culture in cooled down boiled water etc. this time, i read a post where someone had added it right to the blender and got good results. i am not going to re salt them unless you think its the right thing to do. Wendy, day 2 is not enough to judge if you will get a mold or not, you should wait at least 7-10 days, and at this time it will stil be very subtle. Well, I never tried but I think it should work too if you added the cultures directly to the blender. Be patient and hopefully you will see some blue mold growing, little by little. By the way, no need to re-salt, once is enough. Thanks dude. will let you know what happens. i will still turn them every day. This is my 2nd batch of the blue cheese. After 2 weeks, the exterior had some nice mold growing. I poked holes in it early on and when I cut it open after 2 weeks there wasn’t any veining going on inside. I crumbled the cheese and re-packed it as you suggest. I’m wondering if your intention of crumbling and re-packing is simply to redistribute the mold from the exterior to the interior, almost as if to “fake” the veining. I’m still enjoying the first batch, even without the veins. Thanks again for this marvelous recipe! Not at all, it’s not to fake the veining or redistribute the mold (it’s already present everywhere in the cheese). The thing is, blue mold grows in contact with air, so if you want to have blue inside the cheese, you need holes. I found out that sometimes it’s not enough to pierce holes, since the cheese has a lot of moisture the holes usually close up after a few days. “Crumbling” the cheese into small pieces and not packing it too much when placing it back into the mold is the best way to have good veining inside. I think I’m going to re-pack it again. My crumbles were pretty big and I might have packed it too much. Thanks again for your guidance. Thank you so much Thomas! Just tried my bleu cheese after five weeks and it is FANTASTIC!! Amazing flavor and texture… best bleu cheese EVER!! Gonna let the second one go two more weeks if we can wait that long 😉 LOL On to Camembert next! Can’t wait to see what you create in the future…you’re a genius! Thank you so much for your feedback Jeanne!! I really appreciate it. Trust me, the additional two weeks of wait will be worth it! Absolutely ⭐️⭐️⭐️⭐️⭐️ (I’d give more if I could) Definitely worth the wait!! Hi! I’m gathering supplies to try your cheese recipe. Thank you for all of your research! The penicillin on your link is powder, could you possibly link to the liquid form that you mention? Hi, liquid and powder work just the same, I tried both and I got the same results. It seems the liquid one is harder to find in the US though. I ordered the powdered form that was in your recipe link. seems like a very small amount in envelope. is enough for 250 gallons of milk– aprox 1/4 tsp of culture or about .3 grams. how much of this should I use each batch?? In the recipe, I’m recommending 1/8 tsp because it’s the easiest to measure but you don’t even need to use that much. 1/32 tsp (or a tip of a fork) is enough and works great. Once you have blue cheese, you can also save 1 tbsp of the cheese and add it to your next batch, it’s free mold! Thanks Thomas…. I am making the smoked Hickory now. Will start the Blue Cheese next. Let me know how it works with pine nuts. Regarding the ripened cheese, it’s a tough question, it all depends on what type of cheese it was, did it have a rind? Was it a hard or soft cheese, etc…I guess you should first ask him what kind of cultures he is using, and then check if they happen to be vegan and not grown on lactose. Once you know that you can do some additional research regarding the process and aging required for this type of cheese. Be aware cultures act differently on cashews than they do on dairy milk, so it’s not always easy to get satisfying results at the first try. Thanks much. Good suggestions. I’ve emailed them to ask about the culture, but have not heard back. So I might try experimenting to see if I get a result with pine nuts, and if I do, I’ll gradually convert to all-vegan. Hello, the link to the penicillium is a powder (yes I read your note, thank you ) but you mention a bottle of this product. Do you know where I can purchase the bottled form? Hi just stumbled on this site and am really interested re the mold. When I worked in a lab we used to inoculate petri dishes by taking small amount of mould from one dish and inoculate another. Keep it in an incubator and viola you have another mold. I guess this would work too in this. What do ye think??? Yes it is possible. Once you have a vegan blue cheese, you should be able to add a tablespoon or two of it into a new batch of cashew cream. Same for the camembert. You can use a piece of dairy blue cheese as a starter but I think it will take at least 3-4 batches before getting a dairy-free and totally vegan blue cheese. So frustrated! The link for Roquefort is for a product that is definitely NOT vegan !? I have to change the link regularly because it gets out of stock very often. Unfortunately sometimes they change the product reference and not all molds are “vegan”. Now for additional information, non-vegan molds are grown on lactose (a form of sugar), this is why it’s listed in the allergen list, but there is very little chance you will find lactose in the final cheese. However I understand you want to use a totally vegan product, and I can assure you it’s possible to find vegan molds that are grown on maltodextrine, but for the penicillium roqueforti it seems it’s harder to find in the US. I couldn’t find the full documentation but it seems the excipient is dextrine so there are great chances it will be vegan. I will do more research to see if there is another vegan one available on Amazon. Hey, quick question. After salted, do I keep the cheese in the fridge or is fridge time over and the cheese is left at room temp? Yes you always keep the cheeses in the fridge, or in a cold room (56°F max). Sorry about that, I have to change the Amazon link regularly because it gets out of stock very often and I picked the wrong one. There are different types of penicillium roqueforti, some grown on lactose, some on maltodextrine, another form of sugar. So, if you are very strict about it, I would recommend not using it. Be aware that considering the amount used, you won’t really find lactose in your cheese, again it is *grown* on lactose but you are using the mold part (that may contain small traces of lactose). I don’t have another link to give you for the moment because it’s hard to find a vegan one in the US it seems. I remove the link from the recipe in the meantime. Vegan God bless you Thomas. I have been a vegan for about 8 months now, I come from France, and naturally blue cheese is the ONLY thing I ‘missed’ (i’m ashamed though). Looking at the picture of that VBC borderline gave me tremors. It looks magnificent, and it has penicillium roquerforti (Roquefort was the one for me…). So far I used Follow Your Heart VBC sauce but i dreamed that it would solidify and I could cut through it haa. Thank you so much, your recipe is evidence that anything can be reproduced and veganized and once again proves the uselessness of non-plant based diet. Just today I gathered all the ingredients to start. Wish me luck !!!! I would not recommend wrapping them in parchment paper, it’s not the same as cheese paper which is designed to let the cheeses breathe. Hi and thank you so much for posting this recipe. I’m now on day 8 and it couldn’t have gone better. My cheese is covered in blue mold, all over it, and it’s really solid. Should I still wait 6 more days to scramble it or can I do it now? Does this affect the aging or anything? And one more thing – my mixture was a bit gritty. It was the best I could do with my food processor, but I guess maybe the grittiness will smooth out after a while? You know, because cashews have this way of softening up. Do you have experience with this? If it’s already firmer, then yes you can scramble it into small pieces and repack without pressing too much. You will still have to let it age for 3-4 weeks after that. My cheese is now done, I posted a photo of it on my instagram: @phlokus. Tagged you in it! Extremely happy. Thank you so much! Hello Thomas, I can’t help but tell you your work is absolutely amazing. Will soon try your recipes! I have a question for you: what about Blue Cheese with Mascarpone? How would you veganize it? May be a new challenge? Thank you, your website is so inspiring! Hi, I’ve been vegan for about 8 years and the only thing I miss about being vegetarian is STRONG blue cheese like Stilton. I haven’t tried a vegan substitute that even comes close to having the kind of flavour I’m after. I want to try your recipe but I am allergic to ALL NUTS. Do you think I could try to make this with seeds instead? Maybe pine nuts (which are seeds) or sunflower seeds? I live in the UK, hopefully I can find the vegan penicillin online somewhere. I can understand your feeling, there is at this time no good blue cheese available in stores. I only tried with cashews, but Melissa, a reader, tried it with pine nuts and it seems to work very well! The only problem is the price of pine nuts though… I would not recommend trying with sunflower seeds, I doubt you will get a nice texture or taste. Also, it’s penicillium candidum, not penicillin, two completely different ingredients, make sure to get the good one 😉 You can find vegan cultures on cashewbert.com, they ship in Europe. Good luck! Thanks for that Thomas. I’ll try to get the ingredients and have a go sometime in the near future. I am aware that pine nuts are really expensive and I only buy organic which makes it worse. Can’t wait to try! Rachel, my all-pine nut cheeses are doing really well. They are softer, so you may want to try less water. Mine spread out during the first 9 days, before developing a rind. After I crumbled them, I noticed that they started giving off a LOT of oil–so in the future I might try not adding as much coconut oil. Or maybe even removing it altogether. All pine nuts are different though–some are more oily than others, so it’s something just to watch. Good luck!! I have a question! Is the liquid penicillium roqueforti that you have on your ingredient list now 100 percent vegan? Thank you! Your recipe looks so good. It seems suppliers on Amazon change the reference of the penicillium roqueforti regularly so I can’t say for sure it’s a 100% vegan one. If you are located in Europe you can find vegan molds on Cashewbert.com, otherwise, you might have to do more research about it to find a fully vegan one. Regarding the amount used (basically a pinch), I would not worry too much about it. I need help with this recipe. I’m confused. After 2 days in the fridge I remove the spring form pan and salted. Now do I put it back in the pan and back in the fridge or do I leave it out on the counter? Or do I leave it out of the pan but put it in the fridge? If so do I still cover with the plastic box? You should never let the cheeses stay on the counter, always keep them in the fridge or at a temperature of around 50°F (10°C). Once removed from the pan, place them in a box, in your fridge, without the pans. I hope this helps, let me know if you have other questions! Do you run an increasd risk of cross contamination of cheese strains using the bamboo stacked system? Thank you for the hard work. So looking forward to the finished cheese. Just salted and put back in the fridge so several weeks out still. Question regarding the plastic cover, I put the cheese on a flat sheet and covered with a deep metal baking pan in the fridge. Will this be okay? If your baking pan is very clean it should be okay. I would recommend glass or plastic though, when possible. Think I must have done something wrong the end product looks right but tastes very salty with a bit of a medicicine taste. Not sure where I went wrong. You can almost taste what it should be but not. HELP! Unfortunately I can’t tell you what went wrong exactly, it can be so many things…Regarding the salt, you only salted once right? The medicine taste, I never had that problem, it could be a wrong temperature or humidity but it’s hard to say unfortunately. Thanks Thomas. Correct, only salted once. I’m going to try again 🙂 wish me luck. Thank you so much for sharing these things, it’s so generous. You really make a better world! Anyway to get the nutritional info on this? Would be eternally grateful! It’s pretty hard to calculate exactly, it’s 99% cashews so I guess it has about the same nutritional value per 100g. Hi Thomas, One more question before I begin: this source for the mold culture lists 3 strains. If you scroll down you’ll see a description of the differences between them. The first two call for rennet and/or other additions. Since your recipe doesn’t call for additional cultures, is it safe to assume I should get the PS (mildest) variety which can be used alone? Thanks, can’t wait to begin!! No you can use the PA or PV, they just work the same and will work with probiotics too. Be careful though, these are not completely vegan, in case you were very strict about it. I’ve been reading all the comments and I come back to what you advised about take 1 or 2 tablespoons of a good blue cheese (dairy) and using that as your “starter” and that seems like a nifty way to getting around all the worries people are having about it not working. And you said that by 3-4 batches you will have a vegan strain. Could you do that with a Roquefort — one that is particularly tasty — or even a gorgonzola? I am vegan and try very hard to avoid animal products both for humanitarian reasons and health reasons, but nothing in life is perfect and this seems like a good path to achieving what one wants — a tasty, sufficiently moldy comestible. Yes I believe after a few batch it should be *almost* vegan, but it could take a few more batches, you can’t really measure that. Roquefort and gorgonzola both use penicillium roqueforti, what makes the flavor different for each is the process, milk used, aging conditions, etc, not really the mold. So you will probably get the same results as if you used penicillium roqueforti mold directly. Making homemade kefir is on my todo list 🙂 just like homemade tempeh! Can’t wait to hear how the cheeses turn out for you! Hi Thomas, I think I am ok with this question but need to check. I am making both blue and white chees but I have blue mould growing on my white cheese. They are in seperate boxes but think I turned blue chees first and may have transferred blue mould onto white, I have used food service gloves and mould does stick to them and have a little white mould on the blue. The blue will be ready to eat on the 18 so will post pic and let you know how they turned out. Always use different gloves for each type of cheese 🙂 Nothing dramatic though, I’m sure your cheeses will still taste great. The blue on the white is a bit more annoying though since you won’t have a uniform white rind, but it will still be edible. Yes I have been experimenting with different molds and cultures. You are right, B. Linens is the one used for washed rind cheeses. My latest batches with B. linens never got an orange rind but the taste was very interesting and really different than when using penicillium, I’m going to make more tests with different process and temperatures in hope of getting a rind. Regarding other cultures I don’t have anything to share yet, sorry. Well I guess pine nuts have more fat than cashews, and maybe they don’t absorb the coconut oil as well as cashews do. Sure, you don’t have to crumble them, the taste will still be great. The crumbling method just makes the inside a bit more aerated and that leads to more blue veins. Hi Thomas! I’m looking for trying this recipe 🙂 Simple question, what size of springform pans are you using? Any recommendations? Thanks! Thank you so much for sharing this recipe. My first batch of blue didn’t work for numerous reason. I think I added too much liquid, too much fat also, the bacteria died during transit, I put way too much salt on them & didn’t have the desired temperature to store them in. The result; no bacteria with an incredibly salty and inedible cheese. I am determined to get it right for the next batch though. I have ordered Blue Mould Spores 3 (PRB18) in liquid form and was wondering how much to use exactly, since you have changed the amounts in powdered form above? Yes you have to be very precise in cheese making and follow the exact instructions. You can use 1/8 tsp of liquid penicillium roqueforti, make sure to shake the bottle before using. Thank you very much for sharing this recipe, it’s amazing!! Yes it’s necessary. Roasted cashews have a strong flavor and are drier, it would not work well. oh oh, I realize I made a mistake and added salt (to taste) to the blender with the other ingredients. Is this going to interrupt the fermenting or mold growth process? Or is it just going to be too salty? No it won’t, they might just be a bit too salty. You can’t really follow directions given on the package because dairy cheese making is a totally different technique, the milk is curdled and in the end it requires about 2L of milk to make one cheese. I’m recommending 1/8 tsp because it’s the easier to measure for such small batches, but I’m positive it would work with 1/16 tsp. Thanks for getting back to me, you are VERY dedicated to your readers! I’ll stick to the 1/8 tsp and see how I go. Thanks again . Hi – how did this go – I’m also in Oz (Perth) and have bought the same mould – before I start making the cheese I was wondering how did the 1/8 tsp in a cup of water work? Any other advice from an Australian perspective would be appreciated. Cheers. Is the green living one vegan??? Well, I’m on day 6 in the fridge and my mounds are still so wet, I can’t even take off the paper! I tried removing one but it is just a gloppy mess and they don’t seem to be any firmer, one day to the next. I wonder if I should remove the plastic cover to help them dry out? I don’t see any sign of mold developing although they taste super creamy and delicious. The problem is that you probably added too much water when blending the cashews, so it will take longer for them to firm up. Mold will only develop when they are dryer. Yes, I think I added too much water. I noticed some comments by people who used the powder form of the mold who didn’t mix it in water first. I thought I might try that next time. Do you advise against this? For this batch, I actually took off the container lid because I didn’t see any progress in it firming up. Now that it’s had a day to dry out a bit and I can salt and turn them, I can replace the cover. Maybe I’ve confused the process but I figure this is my trial batch and I will eat it whether or not the mold forms! You have no mold yet because your cheeses are too humid, I doubt it’s because you mixed the mold with water. I tried both, mixing with water and adding it directly to the blender, both methods work, but I still prefer to dilute it before just to make sure it will combine well in the cashew cream. Ok, thanks! My Vitamix seemed to be spinning the motor without blending the ingredients so I added a touch extra water. I will not do it next time. One other question: The 3 Cups of cashews called for—is that before soaking? They expand a bit with the soaking so I wondered if I had used too much. I also soaked them for an extra day (2 days total) because I forgot I had to let the mold sit for 24hours in the fridge before using. Yes before soaking, if you let them soak too long you will have to use less water when blending. 1. I’ve just put the mixture into the pans (I used cookie cutters lined with parchment paper), but to help with storage in my refrigerator I’ve put them into parchment lined Tupperware boxes and just put the lids on. Is that ok? Or does it really need to be on a metal baking tray with the box just resting on the top? 2. During this process my finger touched a part of it and I think due to the paper slipping some of the mixture may have touched the metal. Is this a huge problem or should it be ok? 3. I am a real stickler for use by dates, etc. due to suffering from emetophobia (a fear of being sick), so I am slightly nervous about this recipe! I’ve seen a couple of posts about the wrong type of mold, etc. Is there anything which could mean this recipe could pose a bit risky to consume? Fingers crossed all will be ok but if you are able to give me some reassurance, especially in relation to my third question, that would be great! 1. Yes it’s okay to use tupperware boxes, that’s what I usually use, just don’t completely close them. 2. Unless you did some gardening before and your hands were very dirty, it should not be a problem! 3. If you see red/pink mold growing then scrape it off and re-salt where you removed them. Honestly I never had any of these molds growing, so if you use clean tools and boxes you should be okay. Many people made it and I never heard of anyone having that kind of problem. Don’t be afraid of white/blue/green molds, they are good ones 🙂 Regarding the use by date, it can be kept for another month in the fridge if wrapped in aluminium or cheese paper. Hi, Thomas. I had great success with my first batch of blue cheese. I have one stuck in the back of the fridge wrapped in wax paper, trying to get aged to 3 months. I used one for tasting. We ate one. And I have half of another left to last me until the 3-month mark! I have started another batch. This time, I used my own cheese as the “starter” to see if that works. It is now 5 days old and I noticed a slight hue of pink in a couple of spots on a couple of the rounds of cheese. If I understand your message, I can just scrape or cut those off and then reapply salt, correct? can you tell me how to use the mature cheese as a starter? Interesting, I might try that. I bought the penicillium roqueforti and am on my second batch. It is molding very nicely but it doesn’t smell. The taste varies depending on whether the sample is just the inside or includes some of the outside edges which are salted. Next time I think I will add a little salt when blending. I’m curious why mine does not smell. The first batch I made didn’t form mold (refrigerator too cold) but it formed a rind and was delicious! thanks Kathy so instead of culture, i use real cheese with nuts and just keep bringing the real cheese part down, till i have a vegan culture? That is the idea. I am only on the first batch using my cheese (which was started with the piece of roquefort [lactose based] I added. I had a lot of experiences 30 years ago with sourdough starters, vinegar mothers, yogurt as a starter for more yogurt] so I figured it should work with the nut cheese — also I had Thomas’ expert input. Because of his writing, I felt that this might work. It did the first time. Stay tuned for the next few batches. That’s correct, scrap it off and resalt. Hopefully, it won’t come back. Be careful with pink/red molds though, they are not “good” molds. I’m not sure why you got that kind of mold, it can be many things, usually it’s because of too much humidity or droplets in the box. Has anyone tried freezing the finished cheese? It would be wonderfully handy to have some stashed away for ’emergencies’. Would the thawed texture still suit cooking if it wasn’t perfect enough for a cheese board? Now I looked on the website of Cashewbert (you’ve put their link above) and they use things like “papain” and “moromi” in their cheeses. Do you think this will improve the flavor? Have you used these things already? I gives them a different flavor, especially moromi. I didn’t really see a difference with papain in blue cheeses though. If you want to try to improve the flavor you can also try adding some miso. I’m afraid it doesn’t work like that 🙂 The process of making each cheese is very different, not just a matter of molds used. Temperature, humidity, process, etc, all of these need to be tested and tweaked before achieving satisfying results. I am just a few days away from the “crumbling” phase. What I see on my cheeses is not blue mold, but white. My cheese smell like blue cheese. They are quite dry and shaped properly (from the molds I put them in at first) and I don’t think I will have any problems with the crumbling and reshaping. I am assuming that white mold is fine. Do you think I am correct in that assumption? You will see a mix of white and blue molds on your blue cheeses, this is normal. They should not be too dry though, otherwise the mold will have trouble growing in the future, the cheeses should keep their shape but still be soft. They are pretty dry. I am going to do the crumble on Sunday. Is there anything I can do to “wet” them? Maybe run my gloved hands under water before I pick them up to crumble them? I think they need to be covered better. I think I was afraid of them being too wet so I have a grid wrapped in parchment as the “lid” to the container. I will use the real lid after the crumble. But there is white mold growing so it may be hopeful. They sure smell really good. Sorry for the late reply. I would definitely not recommend adding more water at this time, the only time I did this I had to trash them a few days later because they turned bad (and I used clean water that I boiled). Crumble, wait and see 🙂 Mold can take longer to appear sometimes, otherwise try making another batch and keep the cheeses in a container with parchment paper inside so the cheeses don’t touch the plastic bottom. Also change the parchment paper regularly, about once a week so it’s not too wet. When I flipped the cheese this morning, there it was BLUE mold. Yay! Three weeks from the beginning of the process. I have a big smile on my face today. I will be crumbling tomorrow, so I am guessing there will be lots more blue from now on. Thanks so very much, Ryan. With an eye to the future, I think I will start my second batch this week. I am hoping to let it age a little more than the 5 weeks and want to keep a good supply. Then I will tackle the camembert. Oh, Thomas, there’s lots of blue mold peeking at me. I am so pleased. It is four weeks now. I am going to try to wait until they are more moldy before I use them. My plan, after all, is to get a sufficiently potent (bacteria-wise) batch so I can make another batch using this cheese and so on down the line until I feel that all the dairy is out of it. I think you said that should happen within 3 to 4 batches. I am very pleased. I let a friend have a sniff and he was quite surprised at how much like blue cheese they smell. I think I will start soaking some cashews so I can start camembert. And I still look to trying the Pont L’eveque, one of my all time favorite cheeses. I am having great luck with the Camembert, but my blue cheese is not forming blue mold , only a beige tan hew is developing on the edges. Is this what happens first or might my culture have gotten too old to work. I waited 2 month with it in the refrigerator before I used it? I have a macadamia nut farm in Hawaii and am having a great time using your recipes. Thanks so much! Humm if after two months you have no blue mold, I’m afraid something went wrong. Without details on the aging conditions I can’t really tell you what was the problem. Good to hear you successfully made the camembert! Actually the cheese is.only three weeks old. It was the Roquefort culture that was 2 months old. Does the mold on the outside of the cheese start out black or does it begin as a tan color and then turn blue/black?I have been aging it in the refrigerator at 45 degrees. Two weeks old is usually not enough to really see mold appearing. It comes slowly, but I’m not sure what you mean by the tan color. Hello, Thomas! I’m doing the roquefort cheese and in theory mold should have started to appear a week ago, but it didn’t. Does it mean that it won’t appear anymore? I used mold from another vegan roquefort cheese and followed the receipt step by step. Today I have to scrumble it, but it isn’t necessary if mold won’t appear, isn’t it? Thank you very much! There is no exact science in cheese making, depending on the aging conditions it can take more time to appear. Also it depends how much mold you used and if it was evenly distributed. You also need a good aging environment. I had too much water in the mix and it wasn’t firming up. Next batch I will make sure I don’t use as much water.) Since this one is not happening, I removed the plastic container lid and covered it with parchment paper so it could firm up and it is now forming a skin although the inside is still very soft and wet. It is absolutely delicious but tastes more like Camembert than blue cheese! I love it so no loss there.But for the next round I’m still a little confused about the moisture issue. The goal of the plastic lid is to prevent the cheese from getting too cold so the mold can grow but at the same time it should release it’s moisture so it will firm up, yes? It seems the lid prevents the moisture from releasing. Maybe I should leave a little crack so some air can get in? My refrigerator is set to 40° F and it pretty cold as fridges go. Can’t wait to try again! Thanks for all your input. The goal of keeping the cheeses in a container is to keep some moisture inside, not to keep them warmer. Unfortunately 40°F is a bit too cold to age cheeses, they should be aged at around 45-50°F so I would recommend changing a bit the temperature of your fridge. Ah ha! Thanks for info on the refrigerator temperature. 45°-50° F is a big jump from 40°. I will try (and hope all the other food in the fridge will be ok!). Thanks for clarification on the container lids being there to retain moisture, not temperature although the dual goals of getting the cheese to dry out enough to get firm and keeping the moisture in to allow mold development seem at odds. Obviously it works so I’ll give it another go! PS—A google search says standard refrigerator temps should not exceed 40°F for food not to spoil. The recommended is actually 38°F. I hope going to 45°-50° will be ok. Since I don’t eat meat or dairy or eggs, I’m hoping the temperature is less of an issue. Wonderful post and pictures.Beautiful cheese making and technique. I am lover of Blue Cheese and this looks so delectable. Hi! I came here while googling for tofu/soybean based blue cheese. I haven’t looked around on your blog, but I wondered if you have experimented with cheesifying soycurd/tofu etc? Thanks for a great blog and taking on the important mission of making plantbased cheeses! I never tried using tofu of soybeans because they are lacking a bit in fat and I believe the texture would lack in creaminess. The mouthfeel would probably be very different, but if you do try I would love to hear the results! Hi, again. Thanks for the reply. You are probably right. However soybeans are rather fatty, 17% I think. In comparison with other beans that’s a lot, but perhaps not in terms of cheese making. I don’t feel confident yet to start with vegan cheese making, but I will come back and read your recipes and see how it goes! I really doubt it’s a real aged blue cheese with roqueforti mold, more something with nutritional yeast and spirulina for the color. Hello from Greece! this looks amazing! i want to try it! i have a question to make! why the water has to be feltered? is there any particulary reason? Hi Thomas! I was wondering if I can use a bowl instead of my springform, because it may be too big. Thank you! You can use what you have on hand, as long as it’s clean. Make sure to cover with parchment paper so the cheese doesn’t stick to it. I’m really excited to make this! Once I have this I can be 100% dairy free as I can’t eat a salad without a little blue cheese. I’d rather just buy some but this is gonna be a whole lot more interesting! I can only think one thing… THANK YOU! Im a fresh vegan and finding this website today it just feels like I found a pot of gold. Im super excited to make the cheese and hope I coop with the waiting!!! Congrats on your vegan transition Aline! Instead of 4 small cheeses can I make 1 large one or is there a purpose to dividing this into 4? And if not, could I eat the cheeses right away even if they are white and plain? Thank you for all Thomas. Hi Kaii, be patient, wait at least another 10 days, depending on the temperature and humidity it can take more or less time. If you can’t wait, then yes you can eat the cheeses right now 🙂 But you will be missing the blue cheese flavor! I am at about week 4.5 of the cheese and it seems to be going bad (turning a bit yellow, more green mold than blue, and smelling strongly of something that one should not eat). I had experienced some moisture in the container that I was aging the cheese in and am thinking that this is the reason for the “going bad”. Any tips or advice you can offer? Any way that I can still salvage the cheese after this time?? It can be the reason, I recommend you use a kitchen paper towel to absorb excess moisture in the container everyday. It’s not good to have droplets inside the container. I’m afraid you can’t save your cheeses at this time, if they smell bad it’s definitely not a good idea to eat them. They should have a pleasant smell, like fresh cheese, and then a bit stronger like blue cheese. I wish you good luck for your next try! Hi again Thomas! I wanted to report that my experimentation with a mixture of blanched hazelnuts and pine-nuts (33-66%, and 50-50% proportions) both came out beautifully. The mold flavors overpower any strong flavors of the nuts. The blend also seems to grow a slightly different colored mold, with more white and some almost greenish tones. The all-pine nut cheeses were fabulous, but next time I won’t add any coconut oil since they seem to have a high oil content. The mold that grew on the all-pine version was all deep blue–almost identical to the all-cashew cheeese. Interesting. Thanks for sharing your experiments 🙂 I also see color variations depending on the batch when using only cashews, I guess temperature and humidity can have an effect on that. I’m surprised the blue flavor is covering the hazelnut taste though, interesting! Honestly the cheeses never last very long here so I never tried freezing 🙂 I never heard of vacuum sealing cheeses with exterior molds like camembert or blue, most of the time it’s for hard cheeses (alpine style). If you freeze them, then I guess you don’t need to vacuum seal before. Be aware that a blue cheese can last several weeks if wrapped and stored in the fridge. I am allergic to penicillin – this sounds like it’s in that family. Is there an alternative to the one you suggested? Thanks – I do appreciate your experimentation in the kitchen. I too am allergic to penicillin, since age 6, but have never had a problem eating any cheese and especially not any blue cheese or camembert. I don’t think you will have any worries. No it’s not normal, it should never smell bad. I’m not sure what happened, it could be the temperature or maybe too much humidity in the box. Mine smells fishy, which isn’t very appealing…I guess there was too much humidity? Either that, or it caught some bad bacteria. Did you use filtered water when blending the cashews? At which temperature are you aging the cheeses? I had this problem once and had to trash the batch, it was because the aging temperature was too high, the cheeses turned bad. I’m not sure what temp it’s aging at. I originally had it in one fridge, which I think was too cold and didn’t allow the bacteria to grow. Then I moved it into our other fridge, which is warmer, and the cheese started developing blue spots but then morphed into this fishy smelling thing. Maybe I’ll make the fridge cooler and start another batch. Try to check the temperature of your fridges, it’s important. If it’s too warm bad bacterias can develop, if it’s too cold mold will take longer to grow. Can i swap cashews with almonds or does almond need a totally different process ?? I never tried with almonds, I think it should work but the texture might be a bit more grainy than with cashews. Hi Thomas:-) You are a superstar! I have a one question. The powdered penicillium is supposed last for several batches, but there is only 1/4 of teaspoon in package, and recipe ask for 1/8, which is half of this. What am I missing? You are right, the thing is I have to change the amazon link regularly because it gets out of stock very quickly. So depending on the product/brand, there is not always the same amount of mold in the package. Also, I recommend 1/8 tsp because it’s the easiest to measure but even 1/16 would work, molds are very powerful. Alas, my first success did not prepare me for failure on my second try. I am getting a pink hued mold on my cheeses now. I am getting some blue, but the pink scares me. I have scraped and resalted, but I am afraid I should not trust this batch to further efforts. I would be doing the crumbling phase about now, but if you think it’s wiser to chuck them out, that is what I will do and start again. Please advise. Unfortunately, it’s always hard to tell what went wrong…If everything you use (equipment, clean water, springform molds, etc) is very clean then it’s probably a matter of temperature or humidity. This recipe looks amazing. It is the best looking vegan cheese on the internet. Is there anywhere I could buy your blue vegan cheese or Camembert ready made or would you make a batch to order? I would buy it today it looks so good. I’ve been following your instructions to make blue cheese. I am on week 2 of the aging process and still haven’t seen any mould. I’m wondering what you think I may have done wrong. Is it possible I over salted it? I tasted it recently and it was very very salty. I haven’t salted it since but have been flipping it. Is there still hope?! Any advice would be helpful!! This blue cheese recipe sounds like a MUST TRY. So do your camembert and foie gras recipes! I am wondering if you can apply your genius to creating a vegan version of Portugal’s Serra da Estrela cheese? Although France certainly makes some of the most incredible cheeses, there are superb cheeses in other countries and Serra da Estrela is one of the best. I suspect that some of your techniques can reproduce this wonder. Serra is a very soft ripened cheese made from the milk of sheep grazed in Portugal’s Serra de Estrela. It is curdled with cardoons, rather than the more usual rennet, and the result is that the cheese never gets very hard. When the cheese is young it is extremely soft and runny and the usual way it is eaten is that the top rind is sliced off and the cheese is just scooped out with a spoon. As I said, it is very soft, buttery and runny when it is young, with a texture rather like a caramel sauce! As it ages, the texture become thicker, like a soft paté. The flavor of the cheese is exquisite — mild, but cheesy, with a hint of sweetness and all the flavors of the wild herbs and flowers on which the sheep feed in the Serra. There are articles on how the cheese is made online, as well as photos of the finished cheese. It usually comes in a “cake” form about 15cm diameter and about 5 – 6 cm tall. If you think the cheese could be reproduced in a vegan form, the trick would be to capture that unforgettable herbal and floral character of the curd. For a vegan version, I wonder if it might not be achieved by infusing the nut milk base with similar herbs and flowers (perhaps by heating or simmering the milk with the herbs/flowers briefly). Those flavors in Serra aren’t strong or pronounced, but they are clearly there, and, as I said, there is just a hint of sweetness, as well. Sweet as in a champagne that is sec, rather than brut nature! For an herb/flower mix, I’d start by using some sage, thyme and a bay leaf, and some chamomile flowers. I don’t know if it would be better to infuse the herbs/flowers in the milk directly and then strain it, or to make a separate tea/infusion from them and then add it to the milk. That might be better because then one can taste the milk and add more infusion if it’s needed. I suppose it’s possible to find out what kinds of herbs and flowers are indigenous to the Serra da Estrela online, which would give some other hints about what might be the right flavors. I’m not sure what should be use to culture the cheese, but some of the common cultures would probably work — the velvety soft texture of Serra is due to the cardoon rennet, apparently, and the cardoon probably contribute to the flavor of the cheese, as well. I don’t know how the cardoons are used to curdle the milk. Whole? A tea/infusion? Or a product made from the cardoons? It should be possible to find that out online, as well. Anyway, if you are curious and decide to take up the challenge, I urge you to share your results with us! If we can come up with a vegan Serra cheese the world will thank us all!!! Thanks Rob! I never heard of this Portuguese cheese but it looks incredibly creamy! The technique used to make it is also particularly unique but I really doubt cardoons would curdle nut milk. Curdling nut milk requires very specific enzymes so your idea of infusing it with herbs would probably be the way to go. I’m currently experimenting with other types of cheeses but I will keep the name of this one on hand for the future. It might be difficult for me to recreate such kind of cheese though because 1) I never tried it so I have no idea of what it tastes like, and I’m not going to taste any dairy cheeses now, and 2) the texture of this cheese is super creamy and the rind looks firmer, that’s kind of hard to get with cashew cheeses. I will have to check what kind of molds and cultures they are actually using. You just made me so very happy. I can’t wait to check out your other offerings. Thank you, so much, for advocating veganism!!! I KNEW you could use the culture. I have been considering ordering it and try in out myself. Now I don’t have to experiment, because you did it. I have always been a blue cheese lover and am now allergic to milk … (I use to just slice it and eat it.) Now to make it. I have followed it in detail and am at week no. 3 now so all that is left is flipping and waiting. I will however go on a holiday for a couple of weeks and won’t be able to flip the cheeses during this time. Do you think that this will ruin everything? What is the reason for flipping them? Thanks again! I have my cheeses in the fridge, and I’m very excited to see what happens over the next few weeks. A couple of things about the recipe: Unless I’m missing something you don’t say when the cheeses are to be removed from the springform pans. 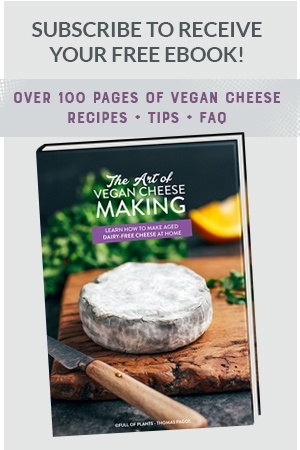 I’m assuming it’s between steps 10 and 11 in the “Forming the Cheese” section. My cheeses are now naked (but under a plastic container) in the fridge. Also, following the recipe above I had enough mixture to not quite fill two 4 inch springform pans, which were the smallest I could find locally. Were you suggesting that we use smaller ones than that, since you’re assuming we can fill four? Where can I find Penicillium Roqueforti? I clicked on the link you shared and looks like it’s unable to purchase? It didn’t say if it’s sold out or something like that. Is there other Penicillium Roqueforti that I can use? I miss blue cheese and can’t wait to make yours! I’d suggest going to Grape and Granary online (you can find them easily on a Google search. I’ve been buying it direct from them rather than through their store on Amazon, because I know they get a bigger cut when selling it direct, and I like to support small businesses. It seems penicillium roqueforti is a bit difficult to find in the US. Check Amazon regularly or search for it on Google, you should find some websites selling it. I just purchased P. Roqueforti culture online with Amazon in the U.S. It was inexpensive and arrived quickly. By the way, they also had the 4 and – inch springform pans for molding/shaping the cheeses in inexpensive sets. The 6-inch pans by Patisse are the right height for a Brie or Blue Cheese. Winco has some 6-inch pans that are deeper. The 4-inch pans by Wilton are also deep, for a smaller but tall-shaped cheese. If you have problems finding the P. Roqueforti and you are not obsessive-compulsive in your veganism, just buy a small piece of Roquefort cheese at the market, scrape out some of the blue veining, and use it as a starter culture for your own vegan blue cheese. It should only take a small amount to inoculate your cashew mixture. You may have to be patient if you do that for the blue veining to develop in your own cheese. the culture that you buy in the US at amazon is NOT VEGAN. so do you think that if you cultivate that on some cashew and then use that to culture you will end up with a vegan culture? I don’t know what is in the commercial P. Roqueforti culture besides bacteria. However, the amount of culture needed to inoculate the quantity of cashew mixture for homemade blue cheese is so small that it’s not likely to cause a reaction in anyone with milk allergies except someone with a hyper-sensitivity to dairy. You could try to veganize the culture by cultivating it on cashew nuts or some other vegan medium, but I don’t think that will solve the problem. Your friend may be sensitive to the P. Roqueforti itself, which reproduces and permeates the cheese in great quantities. You also have to be extremely careful when making cultured cheese that conditions are entirely sanitary. Your friend may have gotten sick because other bacteria got into the cheese mixture from the air or countertops or other means. One way to avoid that is to thoroughly clean your work area, sterilize your blender bowl and other tools and to home pasteurize your cashew mixture after making it but before inoculating it. An easy way is in a big Pyrex dish or measuring cup in the microwave. You just need to heat the mixture to 145ºF and maintain that for 30 minutes. Then let it cool back down, covered, until it’s at a proper temperature for adding the cultures and allowing them to develop. If your friend still gets sick from your cheese after all this she is probably hyper-allergic or sensitive to one of the ingredients and just should avoid it in the future. I have to agree with Rob on this one. If your friend got sick it’s not because of dairy, but probably because of bad molds, or penicillium roqueforti as Rob said. Don’t get me wrong, it’s always better to find a vegan culture, but even non-vegan P. roqueforti or camemberti contain almost no dairy. Yes they are grown on dairy, but what you buy is the mold itself. It may contain traces of dairy but it will be an insignificant amount. In my opinion, the problem happened during the aging process, if you have a too warm environment or too much humidity some bad molds can grow. Usually you will see black or pink mold growing and the smell won’t be inviting. thanks Andrew…. i would love to be able to say its a vegan product and hold my head high…but i will have to do it the long way and be patient. I will let you all know when i start to experiment. i think since the camembert takes a shorter time to cure i will start there. Thanks for sharing Rob! You are correct, it also works by using a small piece of blue cheese. I haven’t tried it myself but some readers did and had great success. After a few batches, you could consider your blue cheese fully vegan. Can I use any other kind of oil since coconut oil il basically saturated fat? Or can I omit oil altogether? I’m afraid you can’t replace it with any other oil, coconut oil hardens at lower temperatures, which is not the case of other oils. You can omit it though, just be aware your cheeses might be a bit less creamy. Hi Thomas, I flipped & salted my cheeses yesterday, then today I flipped them and sprinkled a little more salt as I hadn’t realised that it was just a flipping process. Have I spoiled them or will they be ok if I just carry on flipping them? They are still quite soft but manageable. I have them under a plastic box on parchment. Thanks. If the cheeses have been salted twice, the mold might take a bit longer to appear but it should be okay. Depending on how much salt you used they might be too salty though. I have a question, mostly is asking your opinion if something would be worth trying. I don’t like coconut oil – is there a replacement you can suggest. Very keen to try. Just omit it and you should be good! I just want to thank you for posting this recipe, Thomas. My first two blue cheeses are ready to eat, and in fact the first one is mostly gone already. It really is wonderful, and (as confirmed by dairy-eating friends) indistinguishable from the original. I really wouldn’t have believed this was possible! I have four camemberts maturing in the fridge, and I’m hopeful that’ll be as rewarding an experience. And I’m about to make my second batch of blue cheese and an experimental pair of camemberts made with roasted cashews. Future experiments will include a Swiss cheese, using the appropriate cultures, and blue and camembert cheeses using mesophilic cultures. Have you tried using those instead of probiotics? I don’t usually use probiotics anymore, I find the cheeses to be a bit less sharp/tangy with mesophilic, something that I prefer, but it’s a matter of taste. If you are looking to improve the flavor even more, do some research about aromatic cultures. The roasted cashew camembert culture tastes delicious, by the way. I think that one’s going to be excellent. My cheeses have been in the fridge for 3 weeks now and there’s still no sign go blue anywhere, should I wait? I was thinking of restarting the recipe with a new dose of Penicillium Roqueforti, what do you think? I would advise waiting a bit more, at least 4-5 weeks. If you don’t see any mold then you should start again, make sure to check the temperature and always keep the cheeses in a box to keep enough humidity. My cheese is in a close humid box in the fridge since June 11th ! I have remixed the cheeses with another dose of Penicillium two days ago, I am waiting to see a change! Thanks for sharing that information France. Yes always keep the cheeses covered in a box to keep enough humidity. I know some people had similar problems because their fridge had a fan, it was drying the exterior of the cheeses too fast. Hello. I just made the cashew mixture. I added the mould spores from a packet in the freezer. I’m thinking that it may have been the powder form? It was power like. I didn’t put it in water. Do I need to start again? Might it still work? Could I soak a bit of mould spores in water and stir it through the cashew mixture tomorrow?! I always mix my powdered mould in directly (without mixing it with water first) and the mould always grows. It should be fine. As Adriana said, it’s totally ok to add the powder directly in the blender. I will correct that in the recipe, putting it in water first is not essential. Looks awesome! If I use a piece of roquefort as a starter do I still need to use the probiotics? Or does it substitute the probiotics and mold culture? Yes you still need to use probiotics or a mesophilic culture, the Roquefort piece will substitute the penicillium roqueforti. Why do you have to flip the cheese? Also, when you reform the cheese at two weeks, do you take it out of the springform pans after you reshape it? Flipping the cheese is important to let the mold grow everywhere. If you don’t it won’t grow at the bottom. Yes, once it is reformed, you can carefully remove it from the springform pan right away. Things have been hectic at my home (impending passing of a relative) and it probably is three weeks since I made (my third) batch of cheese. I forgot to reform them. On my second batch, I didn’t even crumble and reform them and, although the blue wasn’t throughout, they taste fantastic. If I reform at this stage (blue is starting) will I cause any problems with the mold — like killing it — or will I just delay things a bit? I took out a piece of cheese I put in waxed paper and shuffled to the back of the fridge 4 months ago and it is OUTSTANDING. What a bite. Compared to my 5-week-old batch, it’s like night and day. But it would not be for everyone. It do love the sharp bite of it, though. Seems to me it would be great on pasta alone, I’m just not sure if it would “melt” enough to coat the pasta. It shouldn’t cause any problems. You won’t kill the mold, it’s strong, don’t worry 🙂 Crumbling gives the cheese nice veins inside and makes it a bit tastier because you get more blue mold, but if you don’t want to crumble it, it will still taste great. It will delay the aging a bit yes. So glad to hear your 4-month-old cheese tasted great! 🙂 Aging really does improve the taste, the flavors are always more complex. I doubt it will melt on pasta but you can still crumble it like ricotta. I don´t know what im doing wrong but my cheeses doesnt get the mold , the last 2 times…. there is one that has very ugly black spots… have ever happened to you? there is a way to fix it? Yes I got some black spots a few times, you just have to scrape them off and re-salt the area, most of the time it never comes back. Now regarding why you don’t get the mold, the problem is usually the temperature and/or humidity levels. Do you keep the cheeses in a box in your refrigerator? Also, do you replace the parchment paper a few times a week? You want some humidity but you shouldn’t have water drops in the box either, that can cause the black spots. Tomorrow is 2 weeks and there is just 1 spot on one cheese that I think might be mould. Should I go ahead and scramble or wait a bit longer. Could I add more mould in anyway ? Could my fridge be too cold? Is there an ideal temperature? I would recommend waiting a bit more (1-2 weeks) before scrambling. If you have a spot of blue mold it’s good, it means the penicillium roqueforti is working and there is no need to add “more”. A fridge that is too cold can slow down the aging. A good temperature would be 50°F (10°C). I usually up the temperature of my fridge a bit when making cheese. That’s really useful, my fridge is much cooler than that probably under 5 Celsius!its winter in Sydney and prob 12 degrees Celsius or less overnight – would it be useful to leave it out of the fridge overnight then in during the day when it is warmer? Or would that variation mess with it? Thanks again! Maybe not overnight, but leaving them at 12 degrees 3-4 hours every day should help speed up the aging process a bit. It won’t mess with it, don’t worry. I usually do something similar with camemberts, leaving them on the counter, at room temperature for 1-2 hours everyday when my fridge is too cold. Thanks Thomas – after just one morning out on the counter I had blue mould going crazy! So excited. I have just been giving it an hour or two before the day warms. Worked a treat. Awesome! 🙂 You are on the right track! Cheeses are always creamier at first, they will firm up slightly in the refrigerator. Salt will help remove some water, but aging is what will make them firmer, so be patient. The soaking time of cashews can also have an impact on the texture, if soaked for more than 12 hours (let’s say 24-36h) I usually don’t have to add as much water. The fact there is no blue mold is okay, it can take up to two weeks before appearing depending on the aging conditions (sometimes more). If it tastes like acetone, I’m sorry but you will have to trash them…It’s definitely not a good sign and it means your cheeses won’t be edible. I had this problem only once (out of over 10 batches), and it was because I aged them at a too high temperature. When I cut one in half, there was a lot of air bubbles inside and it smelled like rotten eggs. Were you aging the cheeses in a refrigerator? At what temperature? Hello! I have roqueforti powder, what is the procedure to cast it in the mixture? Should I mix it with water first? Thank you!!! I have just started making the cheese. I use dried culture but I couldn’t see anywhere in your notes how to use it. So I just added a tiny bit of warm water to the roqueforti and mixed it well and added it to the cashew preparation. I used to mix it with water first, but I found out it works just as well if you add the dry powder to the blender. Was prepping for this awesome recipe, but I think something went wrong; perhaps te refrigirator was not cold enough or I did not push it firm enough (were some holes in it; but the cheese is turning a bit greenish (also on outside) after only 8 days… I used the dried p.roqueforti – exactly as noticed in your recipe. Is this normal or you think it’s ruined and shall I try a new batch? Thanks in advance and keep up the good work; We need people like you! Cheers! Holes inside are okay, don’t worry. I don’t think it’s ruined, if the mold is blue/green then it’s probably a good mold. Depending on the aging conditions, mold can grow quickly or take a long time before appearing. A few times it took as long as 3 weeks to appear on some cheeses I made, and others just 10-12 days. If black mold appears, scrape it off and resalt the area. Good luck! The cheeses are now in their molds inside a plastic box and in a normal fridge. But I’m concerned about the humidity. There is no sign of it in the box. What can I do? Is it a common problem? If your cheeses are in a plastic box in a fridge then you should be good 😉 After a few days you should probably see some water drops in the box, just use a paper towel to absorb excess humidity. Wow! So many comments. Here is a step I added; after fermenting the cheese for 2 days I tied the cheese up in cheese clothe for a few hours to drain out some of the water. When I mixed the nuts in the blender I felt like I was using way too much water. Day 2 and cheese is already firm enough to leave out of the pans. Hope it doesn’t mess it up. Thanks for sharing Clair. It really depends on how long you soak the cashews, if you soak them for more than about 16 hours, then less water will be required when blending. Be aware the cheeses should not be too dry, otherwise, mold will have trouble growing. Good luck with your cheese and let me know how it goes! Hey I have another question. My question for you is how do you prevent too much moisture being in the container with the cheese? I just want to have a good experience without having any other types of mold on it. To prevent too much humidity in the container, you can absorb excess moisture using a paper towel. Just wipe off the water drops. I usually do this once every 2-3 days and never had problems. It’s been a week today since i started with the cheeses. Until now they were a bit soft, but today when I flipped them they were even softer. I had cheese all over my gloves. Could it be because it’s too humid in my box? Or maybe when I made them last week I used too much water? What can be done at this point. I hope that the mold will still appear. It’s probably because you used too much water when blending the cashews (or let them soak too long). It shouldn’t stop the mold from growing. Cheeses will take a bit longer to harden though. Every other day, use a paper towel to wipe off excess humidity in the box and replace the parchment paper if it’s too wet. Hopefully, you will start to see some mold in a week or two. Okay, cheese had blue spots a few days ago now the mold looks fuzzy and white, what should I do? That’s not the right mold, right? You shouldn’t get white fuzzy mold, but it doesn’t mean your cheeses are going bad either. Just scrape it off, or wipe it down with a cloth soaked in salted water. I started the cheeses 3 weeks ago now. One of the 4 cheeses has bluish mold on it. The mold appeared after about 10 days. The other 3 didn’t get it and still don’t have it. I also crumbled all the cheeses after 2 weeks as you said. I find it very weird that only 1 cheese got the mold. They are all in a plastic container in the fridge. It happened to me once. Two of my cheeses had a lot of blue mold and the two others almost nothing. After a few more weeks, blue mold started growing on the others. What you can do to spread the mold is stack the one with mold with another one, or make them touch. If it doesn’t work, then it’s probably because some cheeses dried faster than others. Moisture is essential for mold development. It can happen if the cheese becomes too dry after repacking it. It should not affect the taste though. I had that happen once and I was doing the exact same I did with other batches, so it’s not an exact science. Yes, I would recommend tasting one and see if it’s strong enough for you, if not, wrap in cheese paper and let them age for another week or more in your refrigerator. My cheese doesn’t dry to a point that I can cut it. It’s more like thick heavy cream cheese, spreadable style. If I’ll put it in parchment paper for a while, can that help? How long have you been aging it? Humm…that is weird. The only thing I can imagine is that you used a bit too much water when blending the cashews. After 4 weeks cashew-based cheeses should be easy to handle. Depending on how long you soaked the cashews and the type of cashews used, it might require more or less water when blending. I’m sorry if you’ve answered this already, I did a word search and don’t see that you have… Why refined coconut oil instead of unrefined? Refined coconut oil is odor/tasteless while unrefined has a strong coconut flavor. If you were using unrefined coconut oil, your blue cheese would have a subtle coconut aftertaste, that’s why I recommend using the refined one. Many thanks for your wonderful recipes. I am trying to make vegan cheese for the first time and am following your vegan blue cheese recipe. I am at the scrambling stage and things seem to be going okay – plenty of blue mould developing…when I scrambled the cheese last night the mixture was much wetter than I had expected (more like a wettish cream cheese) and I am therefore not sure that this will allow for many air pockets. Do you think I should try scrambling it again in a few weeks time? So first, if you have plenty of blue mold on the cheeses, that’s great news. It means taste will be there! Now regarding the texture of the cheese, I use the word “scramble” but it won’t scramble like tofu for example. It should have the texture of a soft cheese, and you should make small pieces with your hands before packing them lightly into the moulds. I would not recommend scrambling again as it will make the aging process a bit longer. What you can do if you want more air holes in the end is to pierce cheeses with a clean and thin needle (or use a thin chopstick) in a few weeks, once they will be firmer. If you make another batch in the future, maybe try using a bit less water when blending to have slightly firmer cheeses. Is’n’t there a big difference between 6 capsules of probiotics, and 5 tbsp of rejuvelac ? Even if I prefer probiotics (easier to use and consistent results), I once tried with rejuvelac and had great results, so you should be good with 4-5 tbsp rejuvelac. Is P Roqueforti Culture that you recommend 100% vegan? I am afraid it isn’t. if usually molds for cheese are grown on an animal based products, the cultures are still not vegan. I had the same problem with yoghurt producing. I found only one cultures which were vegan, grown on non animal basis. I really would like to make my own gorgonzola, but I cannot accept any half-measures. Could you please advise? I keep changing the link to penicillium roqueforti, so I can’t say this actual one is 100% vegan. It’s very hard to find vegan cultures in the US, while it’s a lot easier in Europe. If you cannot accept half-measures then I would recommend searching on the internet for fully vegan cultures, but it’s going to be hard to find. Or wait for a company to come up with a plant-based culture. Danisco has some vegan molds (grown on dextrose) but the company itself is not vegan since they are also making molds grown on lactose for the dairy industry…If this is not bothering you then you can check their website to find the ones that are vegan. Good luck with cheese making! It is a dilemma. Buying products from company that influence in destructive way on environment- it could be hypocritical. I will do my best to find succesful solution, despite the fact that it will be inevitably almost impossible. I don’t know if this will help but Parmela Creamery (http://www.parmelacreamery.com) is a vegan cheese maker and they have a blue cheese (although it is currently sold out). If you got that, you could use a bit to start your own cheese. I’m not sure where they get their molds but I imagine they would be happy to communicate that information to you! Every suggestion and advice is helpful and much appreaciated for me 🙂 I will try to contact them and obtain information that they could share with me. So glad to hear everyone liked it! Thanks for the feedback! This looks really amazing and I’m definitely going to give it a try! Just one question about vegan cheeses. Do they melt when you heat them? And if so which ones? Unfortunately, they don’t melt, they become softer when warm though. Can i make your cheeses also with almonds? Personally, I never tried, but some readers had success with almonds. Be aware it won’t be as creamy. This recipe looks absolutely incredible and I couldn’t wait to give it a go! I started the process two weeks ago and my cheeses haven’t developed any blue mold yet :(. I salted them for 3 days ‘cos I didn’t understand the recipe correcty (could that be the reason?). Also, I didnt read that we had to put them in a box so they’ve been sitting on a wire rack for these two weeks. I have a question about the aging process…. Do we have to keep the cheeses inside a covered box? Do we have to put the cheeses on a wire rack (so that air circulates) and cover them with a plastic box? Or do we have to put the cheeses on parchment paper on a wire rack and cover them with a box? Im sorry if these questions seem stupid, but I thought that since my mold hasn’t grown, Im thinking there must be something going on with the way they are aging. Thanks so so so much for your recipes Thomas! I think you blog is one of the best vegan blogs out there! I saw your similar comment two days ago but I didn’t had the chance to reply yet. Salting: I will update the recipe to make it clearer that you should only salt once. Now regarding the mold, it can take more than two weeks for it to show, it depends on the moisture and aging temperature. What is probably happening is that since you salted it twice, mold is having trouble growing. The fact they were not in a box didn’t help either. Penicillium roqueforti (and candidum as well) requires moisture to grow. If the outside of the cheese is dry to touch there is very little chance mold will grow now. What you should do is place the cheeses on a flat plate lined with parchment paper and cover with a box, plastic or glass, both work. Or, use a large box like a Tupperware for example and place parchment paper in the bottom. Keeping the cheeses in a box is essential to keep enough humidity on the outside of the cheeses. Then flip every day and remove excess water inside the box if needed using a kitchen paper towel. You could try to “save” your blue cheeses by scraping the outside and continue to age them in a box, the thing is even if mold grows they might be too salty. OMG this looks so good! I’m on a juice only reboot right now, but If I am gonna eat sollid food again, I will sertenly make this beauty. Nice to sprinkle over a sallad!!!! I cannot wait! Thanks for this recipe Thomas. If I make this, I will let you know. Thanks Jinta! If you start it now it might be ready for your post-juice reboot! Hey Thomas. Thank you for sharing this unbelievable recipe. You’re awesome. So apparently this is a vegan alternative. BTW, let me ask you this: why do you make them in the refrigerator? Have you ever tried to make them at room temperature? Thanks for sharing! It depends on the brand and type of Penicillium Roqueforti. Usually, you can check if it’s lactose-free in the spec sheet of the product. Blue cheese should always be aged at a max temperature of 56°F (13°C) otherwise it will go bad. Room temperature is usually higher than that so using a refrigerator is mandatory. Hi! One question.. Is Penicillium Roquefortii different from Penicillium Candidum?? Yes, it’s totally different. Penicillium roqueforti creates the blue veins in the cheese while penicillium candidum is responsible for the white rind on camemberts. Also, how should I store the cheese once it is done? Thanks for the kind words! It’s not necessary but recommended. At least try to flip them every two days, it’s important for good mold development. Once your cheeses are done you can wrap them in cheese paper and store in the refrigerator for a few weeks. We made this recipe this summer and it came out beautifully. So good, we tripled the recipe and asked our neighbors to age in their refrigerator due to space. However, the cheeses accidentally froze over 2 days, just before the salting stage. I turned the refridgerator down to the lowest setting, but I am worried the bacteria died with the freezing. Suggestions on what I should do? Haha, asking your neighbors is a brilliant idea (if you trust them enough to know they won’t eat them!). I actually never had that situation so I can’t give you an answer but, I would say it should be good. I store my penicillium roqueforti in the freezer and it always works so I don’t believe freezing kills the mold. I just finished the camembert cheese and it’s absolutely fantastic! I was wondering if I could use truffle oil for this cheese instead of coconut oil? What do you think? You could, but I’m afraid it will cover the taste of the blue cheese. Truffle oil doesn’t become firm at cooler temperatures so your cheese would be a bit harder to handle during the first week. Truffle oil can be very strongly flavored. If you want a “truffled” camembert, I would suggest replacing a couple of tablespoons of the coconut oil with truffle oil. That should be enough to give your camembert a truffle flavor without being overpowering or affecting the texture. Truffle oils vary in strength, so you can taste your cheese mixture after you’ve added it to see if there is enough flavor/scent. If not, you can always add another tablespoon or two of oil until you have a flavor you like. I just removed my cheeses from the springform pans- to salt them, and they are still incredibly soft, yet I only used the 5 tablespoons of water – I wonder if I should remove some of the moisture by putting them in a cheesecloth, or just leave them?